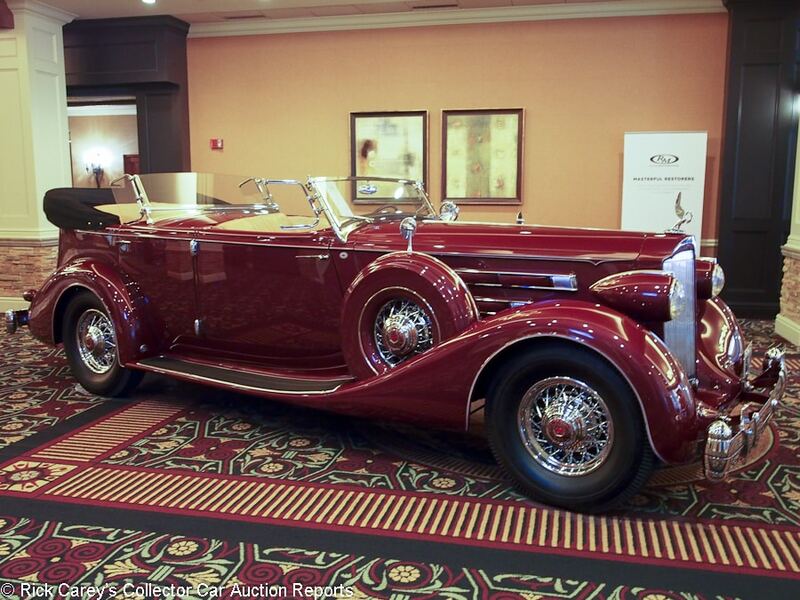 The appeal of coming to Hershey for RM Sotheby’s annual auction has many aspects. Hershey in early October is (when it doesn’t rain and isn’t cold) beautiful, with clear blue skies, gentle breezes and soft, succulent evenings. 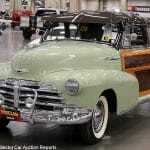 The AACA Fall Meet and its vast swap meet draws collectors, restorers and the plainly curious from across the world. 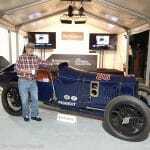 Among car events only at Monterey are there so many languages being spoken, and so many informed, experienced, observations being voiced in them. Go to Gettysburg. The National Military Park is an example of everything the National Park Service does right. Clean, orderly, well-marked, fluidly explained and sincere. There are no opinions expressed at Gettysburg, just respect for the thousands who fought, died and were wounded here. Monuments to the Army of the Potomac and the Army of Northern Virginia are side-by-side, as they should be. And then there are the cars RM Sotheby’s brings to Hershey. It’s always highlighted by collections and this year featured the wonderful cars of Tom Derro. His Pierce-Arrow Silver Arrow and d’Ieteren Freres-bodied Duesenberg Model J were, by themselves, enough to make the trip to Hershey worthwhile. But it is among the less headline-worthy cars that RM Sotheby’s shines. There always is a diverse offering of cars that might be overlooked elsewhere. Ralph Whitworth’s Pete Henderson Deuce Roadster (arguably the basis of why we think in terms of ¼ mile times) and delectable little Ardun head, S.Co.T supercharged Deuce Coupe engendered an enthusiastic response and generous prices. Then there was the re-engined White Yellowstone Park tour bus that cracked open bidders’ wallets to the tune of $165,000. But that’s Big Money. 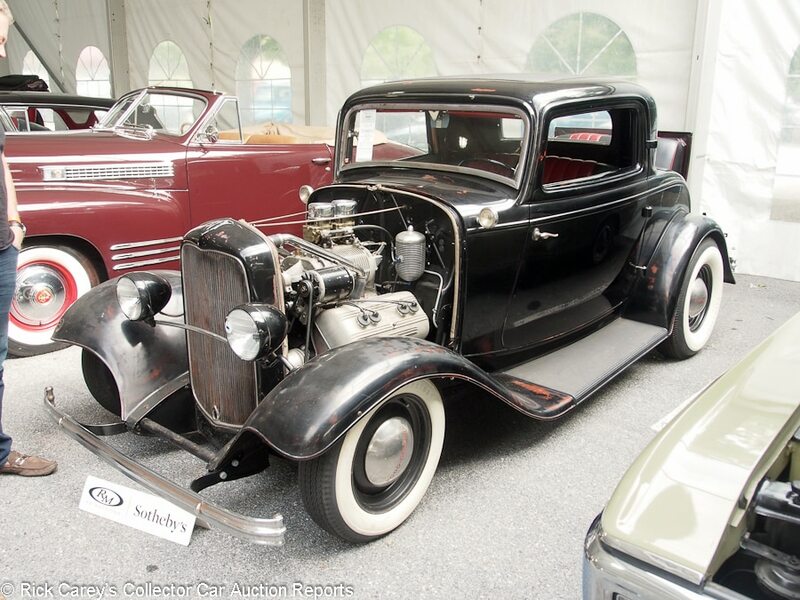 Down in the trenches where most collectors harbor their resources there were choices like the T-Speedster with Rajo overhead intake valve cylinder head. It went to a new owner for a touch over $10K and will be immensely satisfying. It’s that diversity that makes RM Sotheby’s Hershey so satisfying, even when the weather is lousy. The cars that follow (60 of the 138 offered) are sorted by Marque, Model, Body Style and Year. 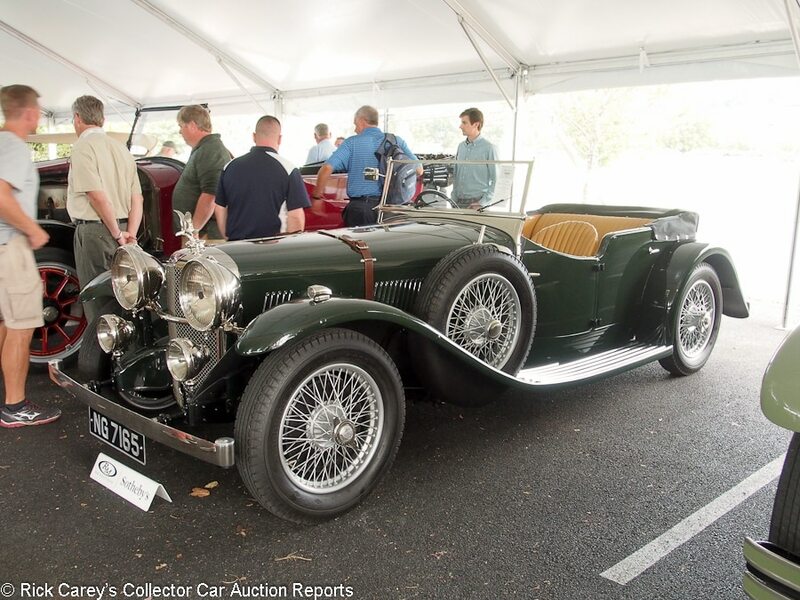 Lot # 240 1934 Alvis Speed 20 SB Sports Tourer, Body by Cross & Ellis; S/N 11337; BR Green/Tan leather; Estimate $150,000 – $200,000; Older restoration, 2 condition; With Reserve; Hammered Sold at $145,000 plus commission of 10.00%; Final Price $159,500. – Painted centerlock wire wheels, Goodrich Silvertown tires, single sidemount spare, leather hood strap, Lucas headlights and driving lights, radiator mascot, suicide doors in front, black cloth boot cover, wood dash. – Clean restored frame. Light scratch on top of the right marker light. Crack in left marker light lens. Very good paint and brightwork. Dull, faded original gauges. Lightly worn upholstery. Well restored, but not a concours car. It is casually showable, though, and great for events, and despite being a low-slung sporty automobile it has room in the back for kids or friends. One of 41 Cross & Ellis SB Tourers. – Sold by Gooding & Company at Pebble Beach in 2013 for $170,500, then by Bonhams at Quail Lodge in 2016 for $165,000. The result here is a little less, but not significantly so and represents a reasonable transaction for both the buyer and the seller who got to put 80 more miles on its odometer. Lot # 180 1969 Buick Riviera 2-Dr. Hardtop; S/N 494879H947125; Olive Beige, Olive vinyl roof/Buckskin Tan vinyl; Estimate $20,000 – $25,000; Visually maintained, largely original, 3 condition; No Reserve; Hammered Sold at $18,500 plus commission of 10.00%; Final Price $20,350. – 430/360hp 4-barrel, automatic, power steering, brakes and seat, tilt steering column, air conditioning, two tone horn, AM-FM, wheel covers, narrow whitewalls, power windows. – Good clearcoat repaint, vinyl roof and original upholstery and interior trim. Engine compartment is original except for repainted valve covers. Represented as 60,785 miles from new and looks like it. – There is a slight premium for the originality of this Riviera and its known miles, entirely appropriate for what it is. 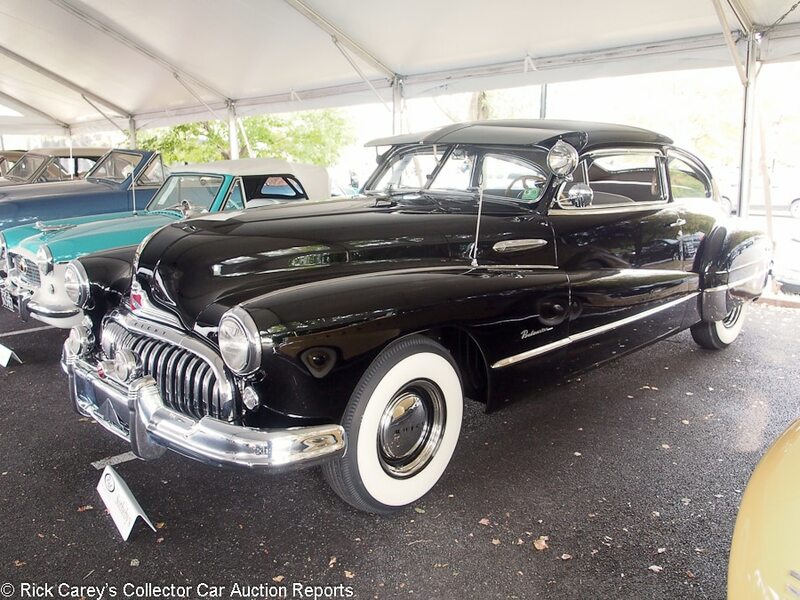 Lot # 232 1946 Buick Roadmaster 2-Dr. Sedanet; S/N Engine No. 46814467; Engine # 46814467; Carlsbad Black/Grey cloth; Estimate $30,000 – $35,000; Visually maintained, largely original, 2- condition; No Reserve; Hammered Sold at $35,000 plus commission of 10.00%; Final Price $38,500. – 3-speed, remote spotlight, pushbutton radio, hubcaps, trim rings, wide whitewalls, windshield and side window visors, skirts, grille guard, Guide fog lights. – Updated with later 40’s Buick trim. Very good panel fits on a difficult design Even gaps, flat panels, great chrome and interior. The underbody is restored, but not quite to the standards of the rest of the car. 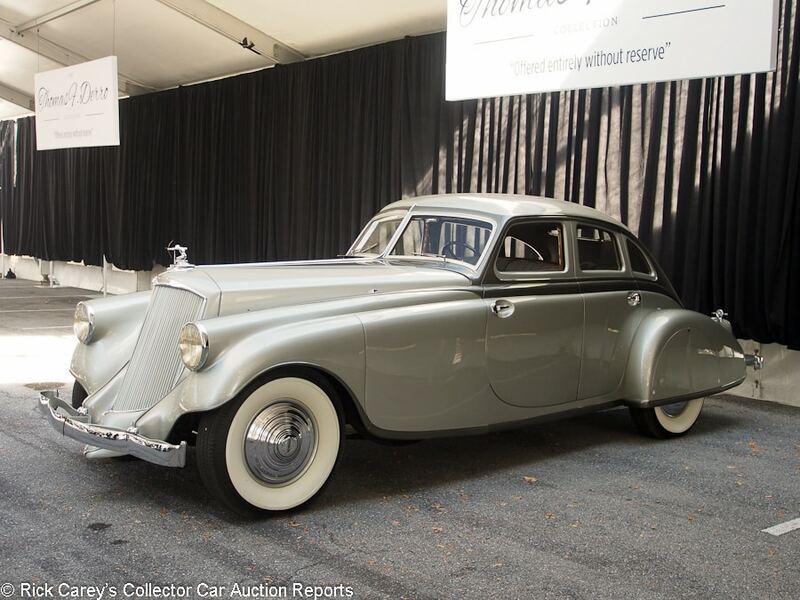 Great acquisition story: The first owner, Erhardt H. Kraft, ordered a 1942 Buick which never got built. In 1945 the dealer called to tell him his car, which he had forgotten he had ordered, had arrived. This 1946 Buick. The dealer paid interest on the deposit. Apparently rarely driven, it is today largely original with an older repaint. – 1942 Buicks and 1946 Buicks were much the same but ones that have survived largely untouched like this are rare indeed. The later grille and trim touches detract little. In fact, they may add to the intriguing history, and the preservation of this car with all its wonderful accessories is special. It brought a superior price, but it has a superior story to go with it. 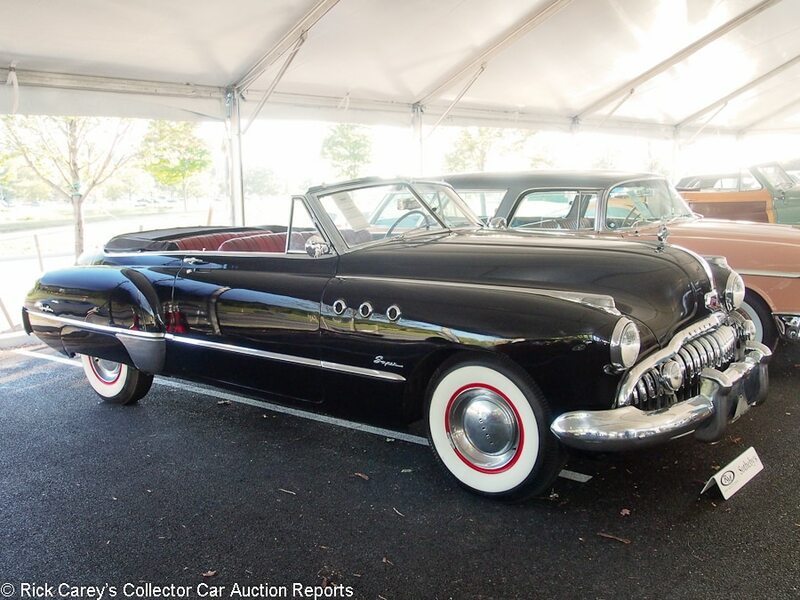 Lot # 145 1949 Buick Super Convertible; S/N 55219939; Engine # 54077305; Black/Dark Red leather; Black cloth top; Estimate $55,000 – $65,000; Visually maintained, largely original, 2- condition; No Reserve; Hammered Sold at $40,000 plus commission of 10.00%; Final Price $44,000. – Dynaflow, pushbutton radio, heater, power windows, power bench seat, skirts, hubcaps, sombrero trim rings, wide whitewalls, Guide fog lights, remote spotlight-mirror. – Very good older paint, chrome and new upholstery. The underbody and engine show little age or use. Good hood, door and trunk fits. There are several touched up small chips, particularly at the rear door edges, but no major noticeable flaws. A well maintained, largely original and highly reassuring car. – A solid Buick that has had a good life and care as it needed it, promising further good experiences for the new owner. Combined with a modest price, that amounts to a sound buy. 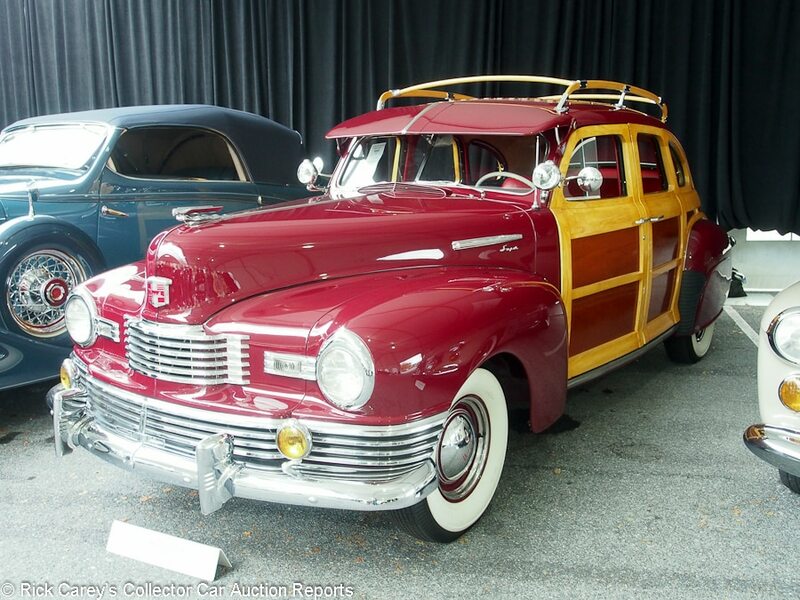 Lot # 247 1940 Buick Super Estate Wagon, Body by Biehl’s Auto Body Works; S/N 0K0612500; Burgundy/Red leather; Estimate $175,000 – $225,000; Concours restoration, 1 condition; With Reserve; Hammered Sold at $145,455 plus commission of 10.00%; Final Price $160,000. – 3-speed, turn signals, large hubcaps, trim rings, wide whitewalls, pushbutton radio, heater. – 2009 AACA National First prize and Senior. Gorgeous paint, chrome, wood, varnish and interior. Beyond perfect everywhere with beautiful new wood and varnish The light African mahogany wood panels are an unusual contrast with the dark mahogany usually seen on woody wagons of the period. 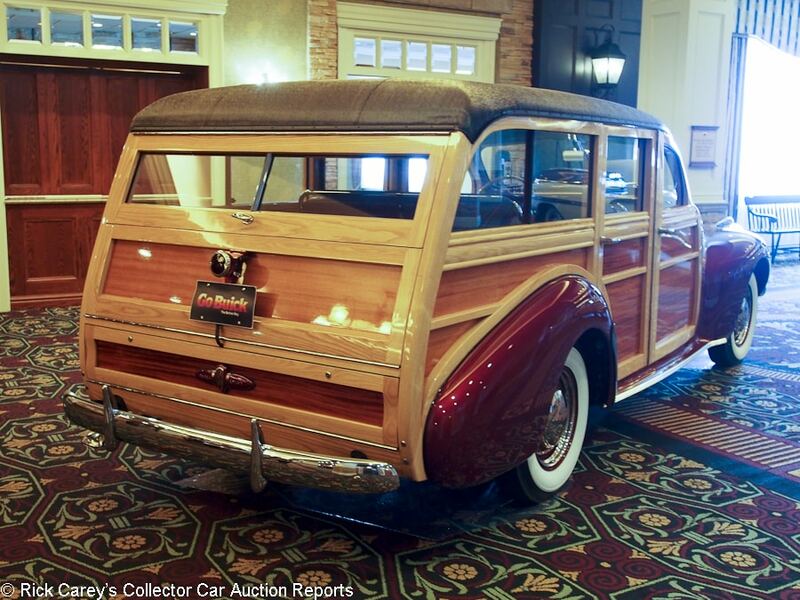 – This Buick has interesting coachwork from the first year Buick build wood station wagons. The roof is low, the beltline is high and the rear windows are very shallow, giving it a custom car look. 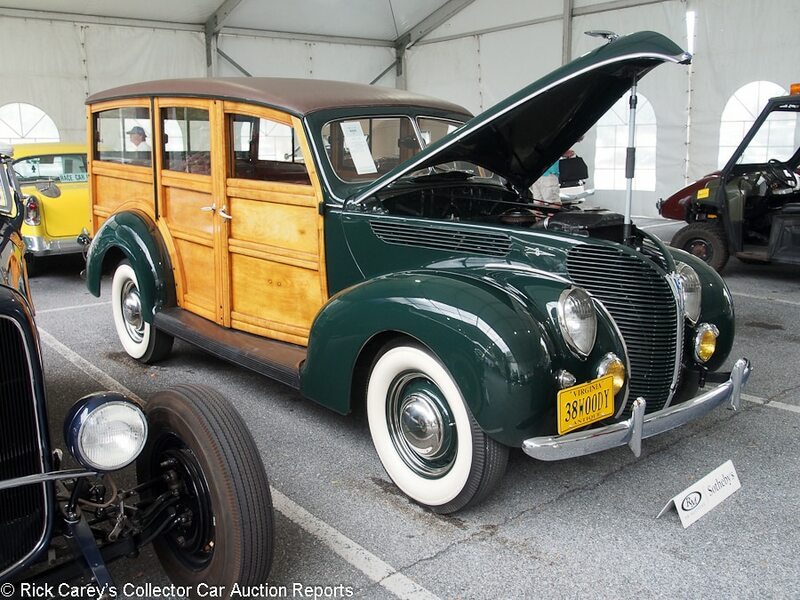 A post-block sale with this all-in result, this Buick will be a standout exhibit at any gathering of woodies and that makes it a responsible purchase even at this price. 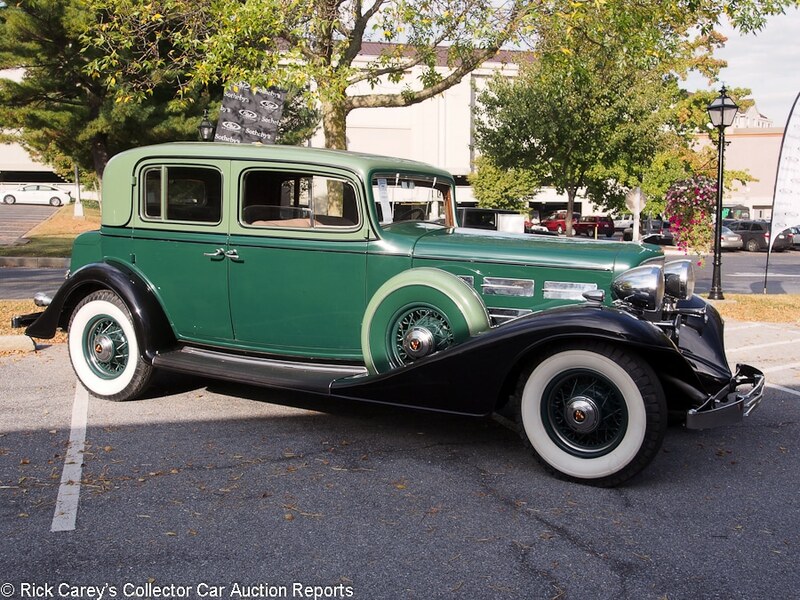 Lot # 167 1933 Cadillac 370-C V-12 5-Passenger Town Sedan, Body by Fisher; S/N Engine No. 4000043; Engine # 4000043; Green, Black fenders, Light Green roof/Beige cloth; Estimate $50,000 – $60,000; Visually maintained, largely original, 3- condition; No Reserve; Hammered Sold at $37,000 plus commission of 10.00%; Final Price $40,700. – Body color wire wheels, wide whitewalls, dual enclosed sidemounts, trunk rack, chrome hood side vents. – Sound older repaint and non-matching front seat upholstery. Rusty chrome, oily engine, delaminating glass, good dash, gauges and interior wood Moth eaten interior trim and rear seat. Chassis and underbody have been stripped and repainted to tour car standards. – It will be a satisfying car on tours, but not one that will proudly displayed in the forecourt of the evening’s lodging. But if it rains or the air takes on a chill the occupants of this Cadillac are going to be a lot more cozy than their counterparts in more stylish (and expensive) open classics. There is plenty to attend to, which is reflected in the modest price it brought. 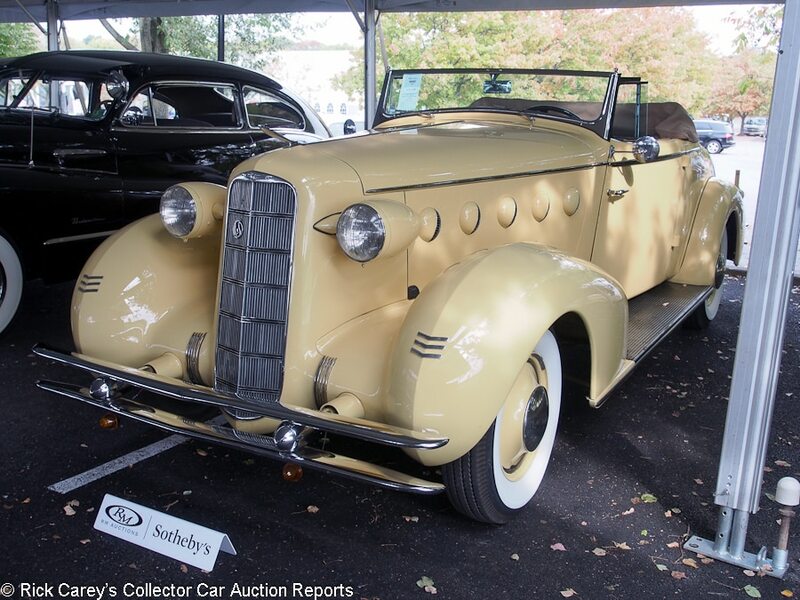 Lot # 161 1936 Cadillac 452 V-16 Convertible Sedan, Body by Fleetwood; S/N Engine No. 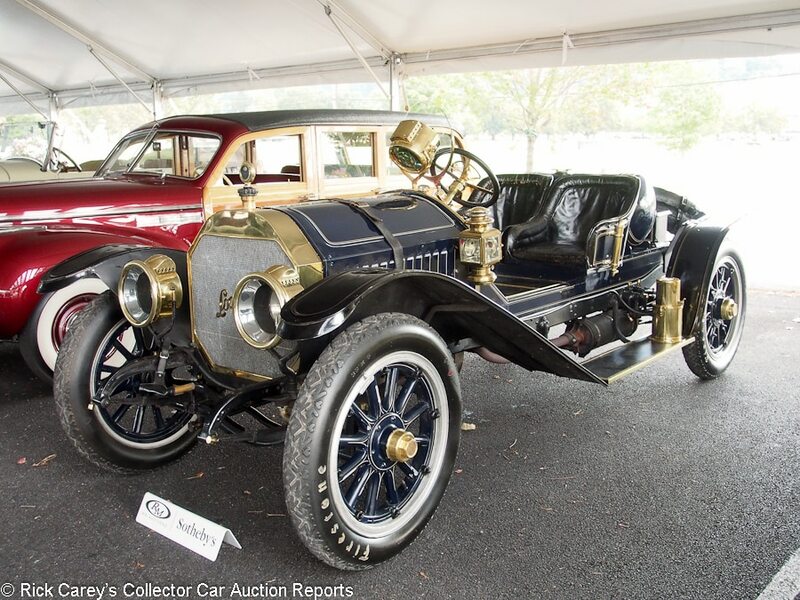 51102221; Engine # 51102221; Phantom Metallic (Grey)/Brown leather; Beige cloth top; Estimate $700,000 – $850,000; Older restoration, 2 condition; With Reserve; Hammered Sold at $650,000 plus commission of 10.00%; Final Price $715,000. – Burgundy steel wheels, wheel covers, wide whitewalls, dual enclosed sidemounts with mirrors, radio, heater, banjo spoke steering wheel. – Displayed for 59 years at Chicago’s Museum of Science & Industry, having only 16,766 miles from new. Excellent paint, chrome and interior. 2015 Pebble Beach class winner restored to showroom condition without going overboard. The engine and underbody are like new with little or no age or use. A wonderful automobile. – Whether on the road or under the hood Cadillac’s V16 was modern art sculpture that goes as smoothly as it looks. This car, with its nearly six decades of preservation in Chicago, is a time capsult that’s never been taken fully apart for restoration. It is a huge price for a late V16 but amply supported by its history, condition and the rare (one of six built) open bodywork. 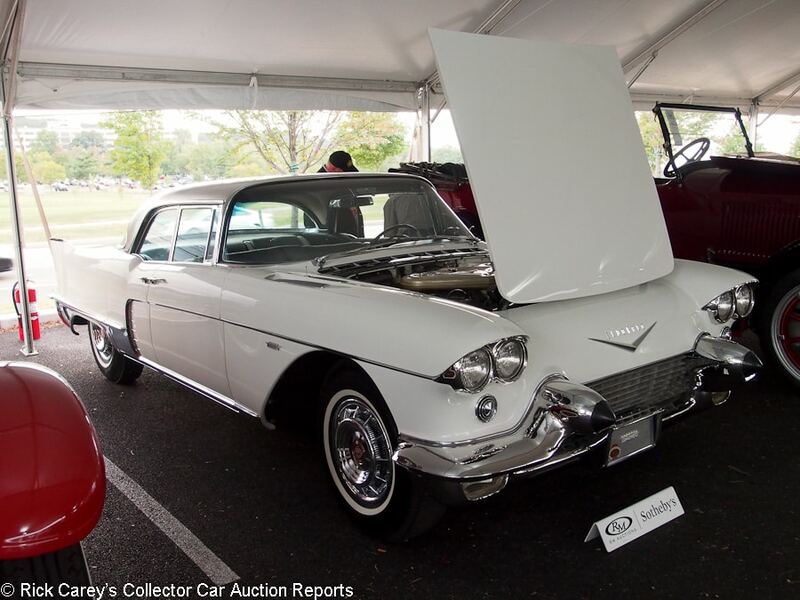 Lot # 238 1957 Cadillac Eldorado Brougham; S/N 5770121759; Alpine White, Stainless Steel roof/White leather, Blue brocade; Estimate $90,000 – $120,000; Visually maintained, largely original, 2- condition; With Reserve; Hammered Sold at $107,500 plus commission of 10.00%; Final Price $118,250. – Dual quads, air conditioning, power steering, power brakes, power windows, power seat, Autronic Eye, WonderBar radio, wheel covers, narrow whitewalls, power antenna, full vanity and nip accessories. – 1994 AACA National First Prize and Senior, represented as 30,176 miles from new. Very good older repaint holding up very well. Excellent original interior. Clean, orderly unrestored engine compartment and underbody Twenty-five years with the current owner. – Offered by RM at Amelia in 2007 where it was reported bid to $125,000, then by Worldwide at Auburn in 2008 with a $130,000 high bid. These cars are impossibly complex to restore correctly. Finding one that has never needed to be restored is the best of all possible worlds. To have the original vanity and shot glasses is nearly impossible. This is a sound value, maybe even better than ‘sound’, and the successful bidder should be highly satisfied with the car and with the price paid for it. 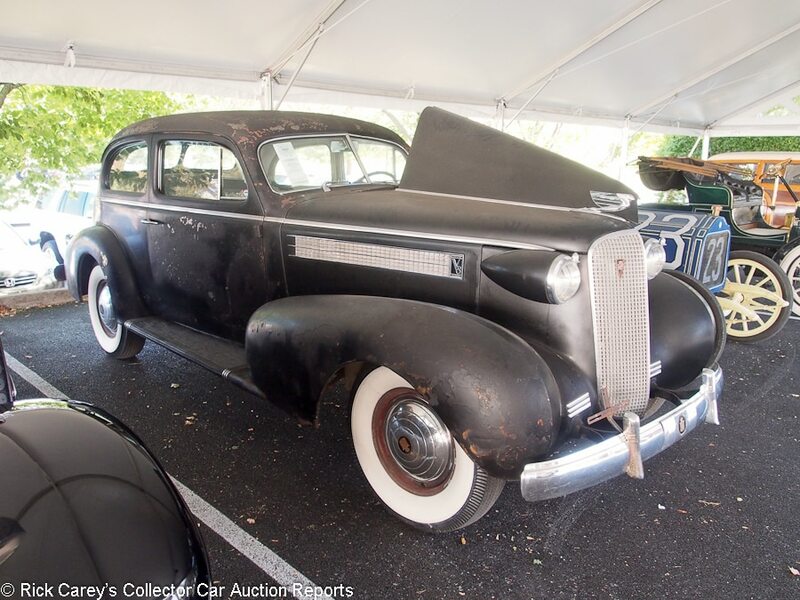 Lot # 131 1937 Cadillac Series 60 5-Passenger Touring Coupe; S/N 6033072; Engine # 6033072; Black/Grey cloth; Estimate $20,000 – $25,000; Unrestored original, 4 condition; No Reserve; Hammered Sold at $16,000 plus commission of 10.00%; Final Price $17,600. – Hubcaps, wide whitewalls, heater. – Dull peeling paint, worn original upholstery. Dirty original engine compartment and chassis. Pitted chrome trim, curdled window seals. No evidence of material body rot or even rust. A project car. – Described in the catalog with ‘much patina’, a statement that is almost humorous in its modesty. It is all patina and it brought patinated project car money. 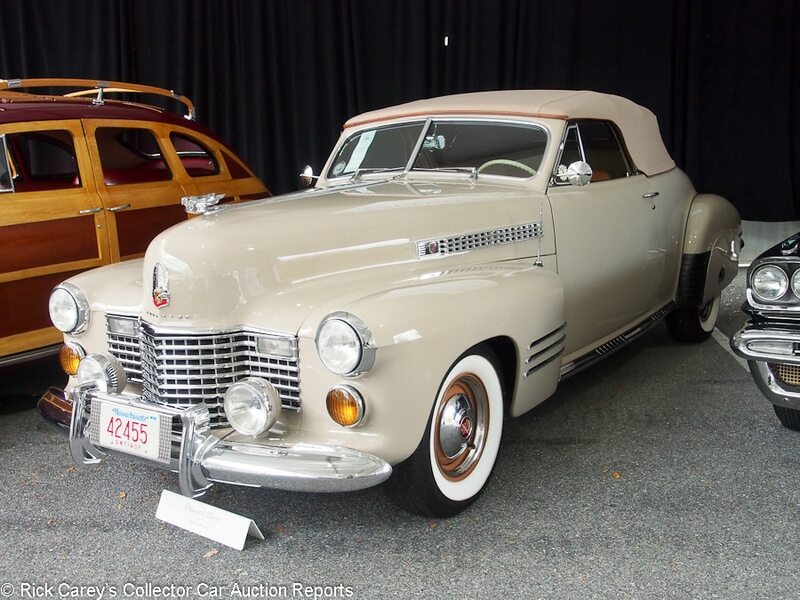 Lot # 166 1941 Cadillac Series 62 Convertible Coupe; S/N Engine No. 8346250; Engine # 8346250; Valcour Maroon/Tan leather; Beige cloth top; Estimate $60,000 – $70,000; Older restoration, 3+ condition; With Reserve; Hammered Sold at $50,000 plus commission of 10.00%; Final Price $55,000. – Automatic, pushbutton radio, skirts, red wheels with hubcaps, whitewalls, turn signals, grille guard. – Sound older paint with many crudely touched up chips. Left rear fender color doesn’t match the rest of the car. Hood and trunk both stand proud on one side. Upholstery is good, with surface creases on the front seat cushion. Underbody was restored and shows its age. A sound and usable tour car. – The price here reflects the age of the restoration and its present condition, as well as the conversion from 3-speed to Hydramatic. 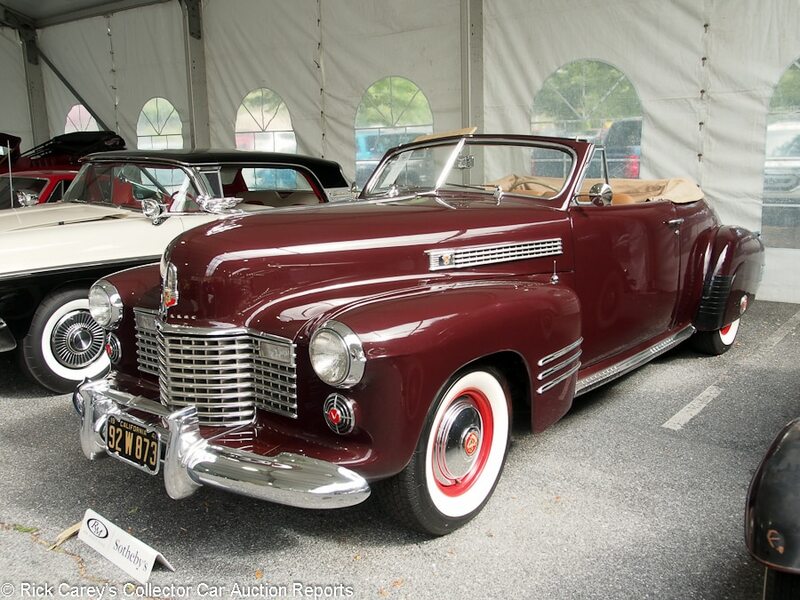 Lot # 255 1941 Cadillac Series 62 Convertible Coupe; S/N Engine No. 8355610; Engine # 8355610; Dusty Gray/Tan leather; Beige cloth top; Estimate $60,000 – $80,000; Older restoration, 2- condition; No Reserve; Hammered Sold at $100,000 plus commission of 10.00%; Final Price $110,000. – 3-speed, skirts, Tan wheels with hubcaps and trim rings, whitewalls, heater, running boards, pushbutton radio, dual outside mirrors, halogen driving lights, coil spring front suspension, lowered rear springs. – Good paint and major chrome. Weak window trim and interior chrome. Good interior with lightly creased front seats. Underbody was done to factory standards and shows road use. Thomas S. Derro Collection. – Somewhat different from the majority of Tom Derro’s cars, this Cadillac has been subtly modified for good road driving manners while retaining its Classic appearance. It is an endearing driver and the Hershey Lodge bidders caught the vibe with this over-estimate result. Is it worth it? Cruising down the highway is the test and it should pass it with flying colors. 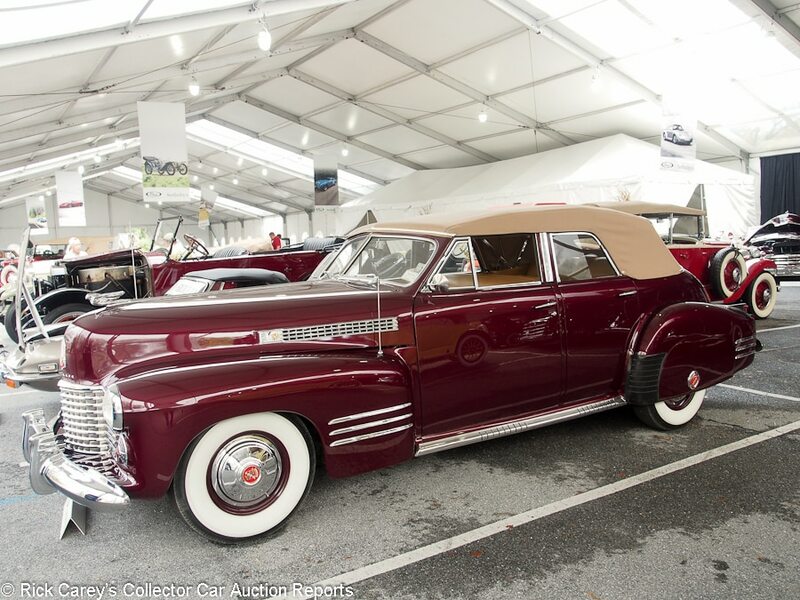 Lot # 250 1941 Cadillac Series 62 Convertible Sedan; S/N 8345581; Metallic Burgundy/Tan leather; Beige cloth top; Estimate $75,000 – $100,000; Older restoration, 1- condition; With Reserve; Hammered Sold at $70,000 plus commission of 10.00%; Final Price $77,000. – Automatic, turn signals, pushbutton radio, hubcaps, radial wide whitewalls, skirts, 12 volt electrics, power steering, supplemental radiator, electric cooling fan. – CCCA National First Prize # 2616, restored in 2000. A small touched up chip behind the driver’s door does little to detract from the gaudy clearcoat paint that glistens like a piece of Christmas hard candy. The interior, top and chrome are excellent, with light surface creasing of the seats and a few lightly soiled spots on the top. The underbody was restored like new but has been driven and is no longer fresh. – The deep clearcoat paint is anachronistic and antipathetic to this Cadillac’s otherwise good presentation. It’s been drive and toured but is still classy, even if a bit over-embellished with paint even GM and duPont could only have dreamed of in 1941. Its obvious quality was apparent at Worldwide’s Houston auction in 2007 where it sold for a magnanimous $145,200. Houston then, Hershey now. More rational sentiments are at work. 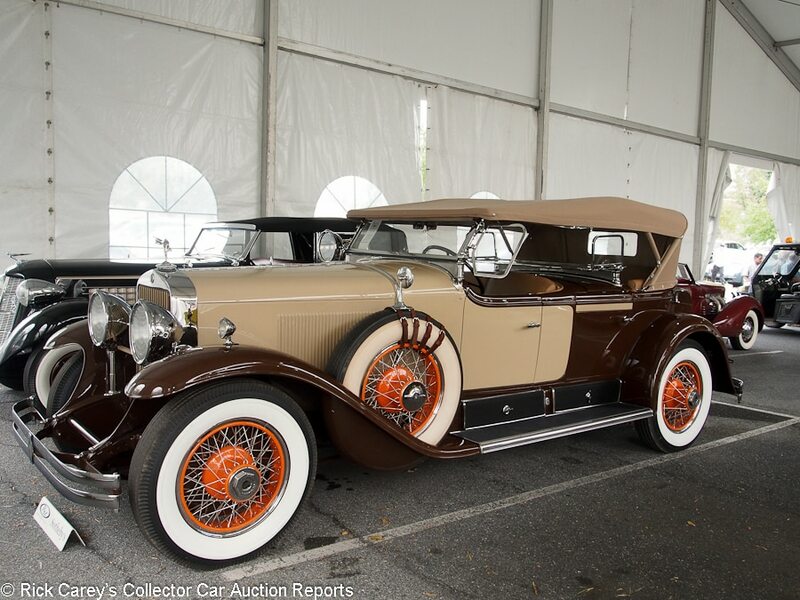 Lot # 164 1929 Cadillac V-8 Sport Phaeton; S/N Engine No. 335049; Engine # 335049; Sand, Brown fenders and accent/Tan leather; Tan cloth top; Estimate $75,000 – $90,000; Older restoration, 2 condition; With Reserve; Hammered Sold at $100,000 plus commission of 10.00%; Final Price $110,000. – Orange wire wheels with chrome spokes, wide whitewalls, dual sidemounts with mirrors, Depress Beam headlights, pedestal mounted right side spotlight, dual windshields with wind wings, metal trunk. – Very good paint, chrome, upholstery and top. Crisp gauge faces. Engine and chassis are nearly like new with some dust but no grime on the chassis. Not concours but almost too good to tour. 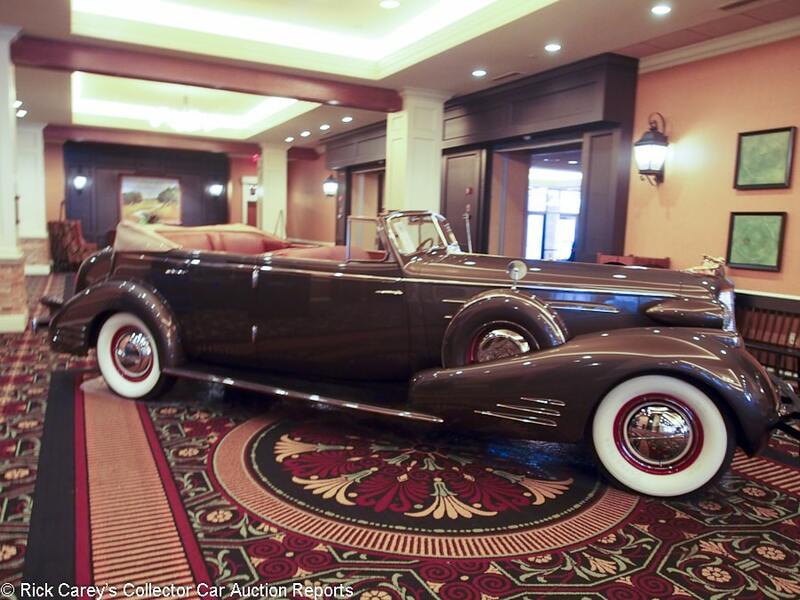 – The appeal of this Cadillac is its beautiful dual windshield sport phaeton coachwork and the quality of its older restoration, which still looks almost good enough to show off on a showroom floor. The bidders appreciated its style and quality with a generous but appropriate price. Lot # 251 1958 Chevrolet Bel Air Impala Convertible; S/N F58L140152; Engine # T103HA; Honey Beige/Gold vinyl; Ivory vinyl top; Estimate $100,000 – $125,000; Recent restoration, 2+ condition; No Reserve; Hammered Sold at $135,000 plus commission of 10.00%; Final Price $148,500. – 348/280hp, Tri-Power, Turboglide, Positraction, power steering and brakes, power bench seat, power windows, skirts, continental kit, dual rear antennas, WonderBar radio, spinner wheel covers, wide whitewalls. – 2012 AACA National First Prize winner, restored in 2008 and still better than new with excellent paint, chrome, interior, top, instruments and glass. The chassis and underbody are like new. – I use to cadge a ride to high school with my neighbor Richie Anderson in his black 348 ’58 Impala convertible and it was magnificent. 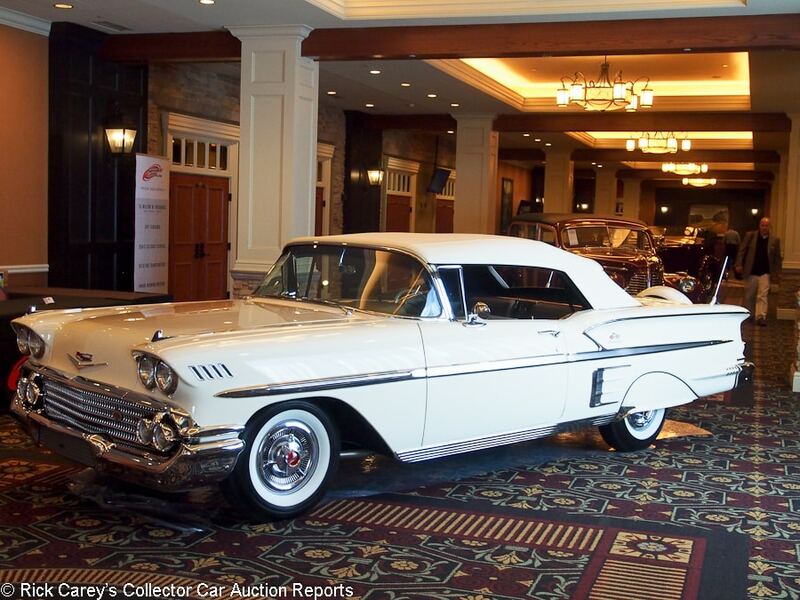 The successful bidders here may have shared a similar experience because even for this meticulously presented ’58 Impala this is a handsome but not irrational price. This is one impressive Impala. 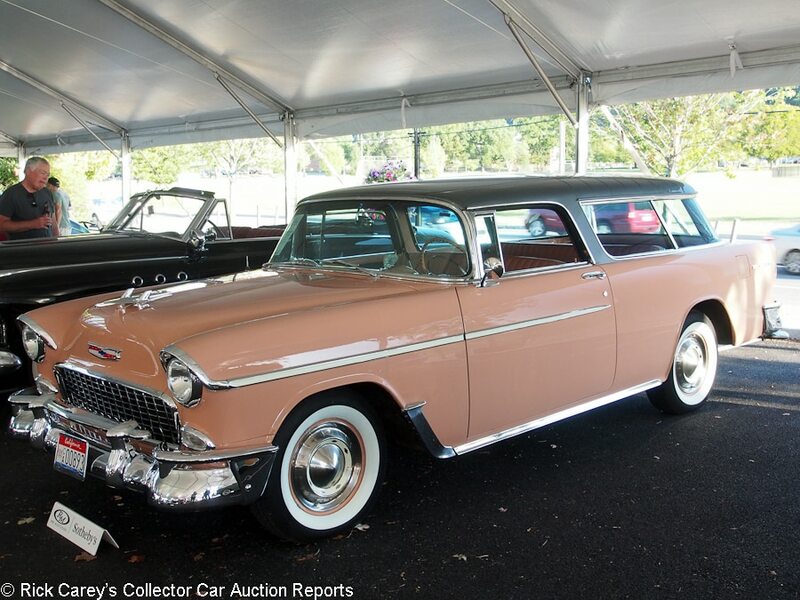 Lot # 144 1955 Chevrolet Bel Air Nomad 2-Dr. Station Wagon; S/N VC55L031515; Engine # 003335T55F; Coral, Shadow Grey Metallic roof/Coral, Grey vinyl; Estimate $55,000 – $65,000; Older restoration, 3+ condition; No Reserve; Hammered Sold at $55,000 plus commission of 10.00%; Final Price $60,500. – 265/162hp with Rochester 2-barrel, Powerglide, Koni shocks, oil filter, power steering and brakes, grille guard, WonderBar radio, power windows, power bench seat, wheel covers, whitewalls. – Formerly owned by Bill Warner. Good paint, chrome, interior, glass, dash and gauges. Old undercoat in the wheel wells. Repair visible behind the driver’s door window and small blisters along the left drip rail. Orderly engine compartment shows use; the chassis is road grimy. Solid body with no evidence of filler. Restored some years ago, then updated with new paint and chrome more recently it now presents like a handsome cosmetic restoration. – Charismatic colors really help this Nomad stand out from any crowd. It is a solid, pleasing car that should be an excellent weekend driver, especially at this realistic price. 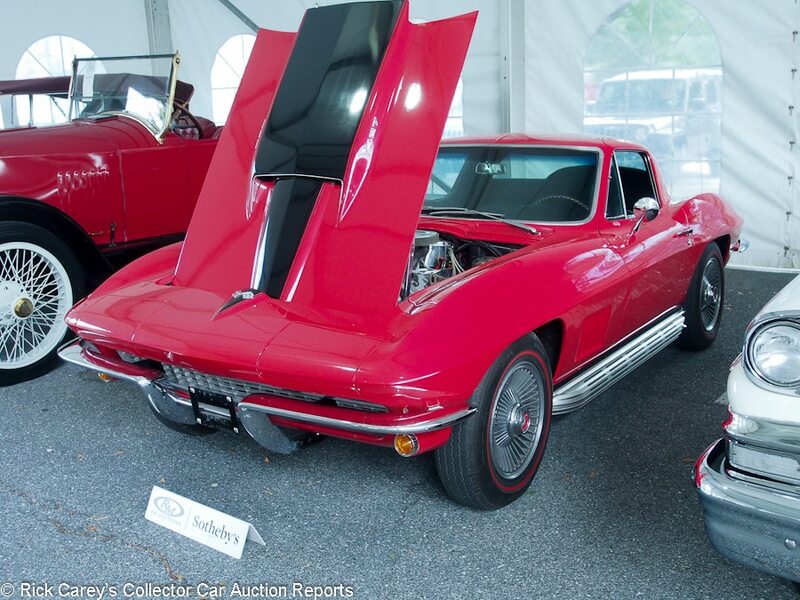 Lot # 168 1967 Chevrolet Corvette 427/435 Coupe; S/N 194377S114963; Engine # T0314JE 7114963; Red, Black stinger/Black; Estimate $125,000 – $150,000; Older restoration, 3+ condition; With Reserve; Not sold at Hammer bid of $100,000. – 427/435hp, 4-speed, AM-FM, power windows, woodgrain steering wheel, alloy wheels, red line Michelin tires, side exhaust, power steering added. – Orderly but aged and used engine compartment and chassis. Good interior, chrome and paint. A good driver. – The reported high bid is appropriate to the car and could have been taken with only a little regret. 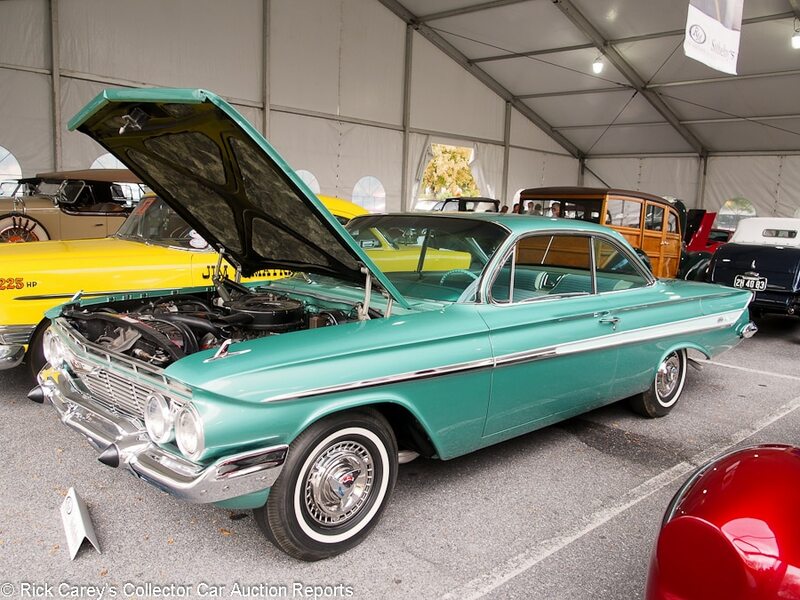 Lot # 174 1961 Chevrolet Impala SS 409 2-Dr. Hardtop; S/N 11837L155023; Arbor Green/Green vinyl; Estimate $90,000 – $110,000; Older restoration, 3+ condition; With Reserve; Hammered Sold at $105,000 plus commission of 10.00%; Final Price $115,500. – 409/360hp 4-barrel, 4-speed, power brakes, power steering, factory air conditioning, bench seat, pushbutton radio, 90 degree knee knocker tach, factory shifter, spinner wheel covers, narrow whitewalls, rear antenna. – No keys. A pillars on both sides at the top corners of the windshield are visibly filled. Otherwise the paint is very good, are the upholstery and chrome. There is one small chip on the side of the left front fender. The engine compartment and underbody have been done and now show age and some use. An unusual combination of equipment in very good older restored condition. Ralph Whitworth collection. – Not very often does a performance-centric early 409 come to market with power brakes, steering and A/C which makes this a highly user-friendly Impala SS. The bidders recognized its rarity and usability and paid full retail for it. 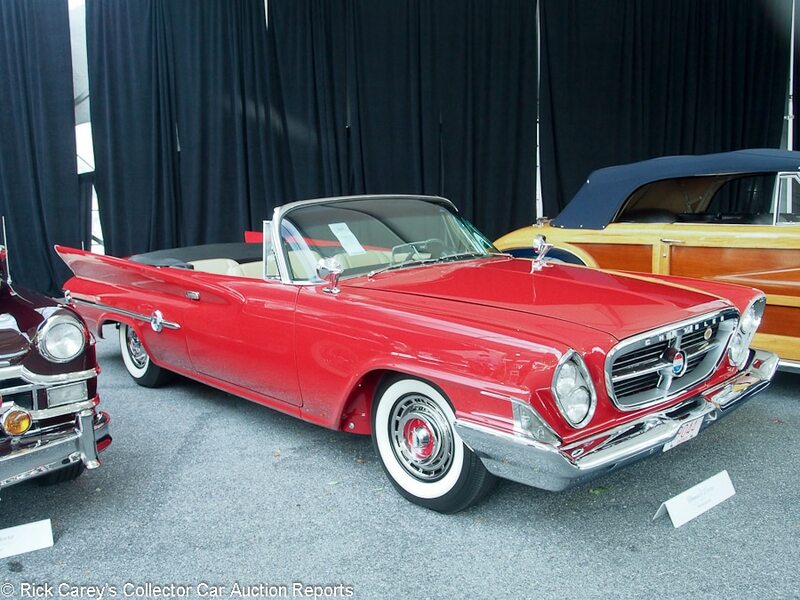 Lot # 258 1961 Chrysler 300G Convertible; S/N 8413114289; Mardi Gras Red/Beige leather; Black vinyl top; Estimate $100,000 – $150,000; Older restoration, 2- condition; No Reserve; Hammered Sold at $135,000 plus commission of 10.00%; Final Price $148,500. – 413/375hp, cross-ram dual quads, automatic, air conditioning, swivel seats, power steering, brakes and windows, buckets & console, wheel covers, whitewalls. – Shiny paint, excellent interior and chrome. Better than new except for a stretched driver’s seat cushion. 2013 AACA Senior First Prize. Thomas F. Derro collection. – Offered at Barrett-Jackson Scottsdale in 2003 where it was freshly restored and bid to $58,750. It reflects the passage of fourteen years today and still brought a superior price. 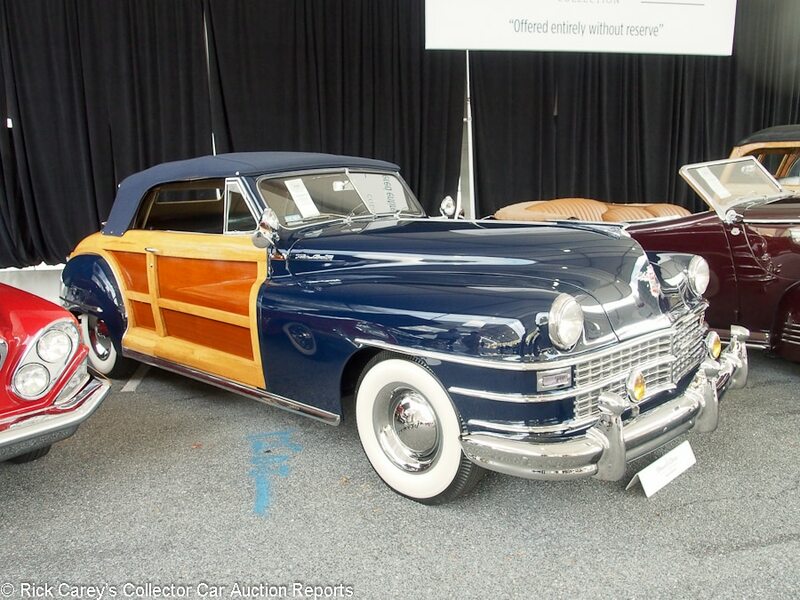 Lot # 263 1947 Chrysler Town and Country Convertible; S/N 7403903; Newport Blue, Varnish/Blue leather, Beige cord; Dark Blue cloth top; Estimate $120,000 – $160,000; Older restoration, 2+ condition; No Reserve; Hammered Sold at $85,000 plus commission of 10.00%; Final Price $93,500. – Fluid Drive, pushbutton radio, dual remote spotlights, hubcaps, sombrero trim rings, wide whitewalls, bumper overriders, fog lights, heater. – 1986 AACA National First Prize and Senior. Excellent paint, interior, wood, chrome and top. Crisp gauges and dashboard. Underbody is better than new, if a little dusty. Thomas F. Derro collection. – There is nothing rational about the late 40’s T&C convertibles. They made no sense at all. But they had style and presence. This is a prime example that brought a realistic price for its restoration’s quality and preservation by Tom Derro. 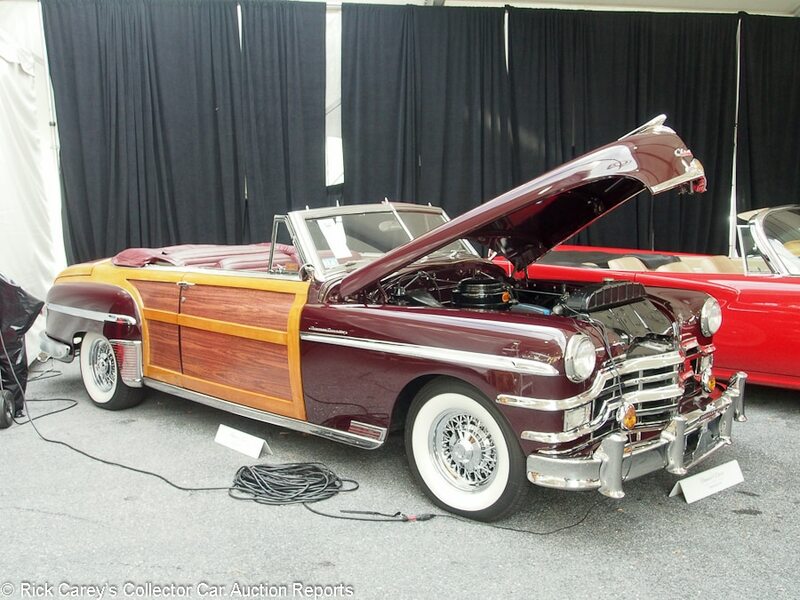 Lot # 260 1949 Chrysler Town and Country Convertible; S/N 7410951; Burgundy/Burgundy leather, Tartan cloth; Burgundy cloth top; Estimate $80,000 – $110,000; Older restoration, 3+ condition; No Reserve; Hammered Sold at $70,000 plus commission of 10.00%; Final Price $77,000. – Fluid Drive, pushbutton radio, turn signals, chrome wire wheels, wide whitewalls, fog lights, grille guard. – Very good paint, chrome and interior. Minor abrasions inside the hood opening on the right side. Orderly older engine compartment. Dirty underbody. The center panel of the rear deck is a dark mahogany pattern fabric backed applique. Right rear windowsill chrome molding is dull. Good body wood with crudely Plastic Wood filled joints behind the top. A sound and unusual driver. Thomas F. Derro collection. – One of the more disappointing cars from Tom Derro’s collection where most were the best of their kind. This isn’t a particularly interesting car and it is presented in condition appropriate to its character. The estate trustees should be particularly satisfied with this generous price for a mediocre car. 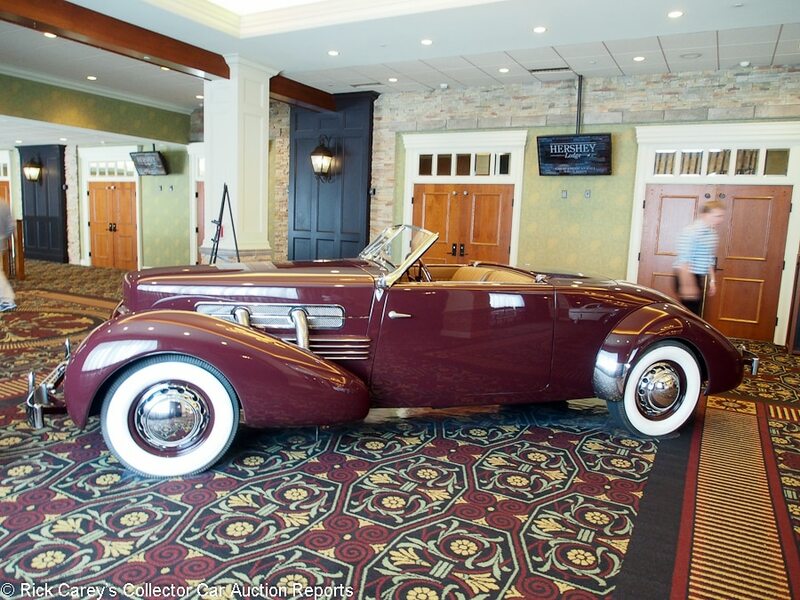 Lot # 252 1937 Cord 812 Supercharged Convertible Sportsman; S/N 81232023F; Engine # FC3232; Rich Maroon/Tan leather; Tan cloth top; Estimate $300,000 – $350,000; Older restoration, 2- condition; With Reserve; Hammered Sold at $375,000 plus commission of 10.00%; Final Price $412,500. – Radio, no heater, hubcaps, wide whitewalls, Richardson axle (Toronado) joints, 12 volt electrics, electric fuel pump, power headlights. – A-C-D Category 1 certified original chassis and body. Replacement engine. Owned for 27 years by Lee Richardson who developed many solutions to the Cord 810/812’s problems. Very good older repaint with some edge chips and minor flaws. Very good lightly surface creased upholstery and interior trim. The chrome is excellent except for blisters in the right windshield post. Chassis has been restored then driven and is lightly dirty. Overspray in the door window pockets. Touched up chip on the right front fender. – E.L. Cord didn’t waste a lot of time testing his companies’ cars, leaving that up to the owners who soon discovered a few rather essential things (like the front wheel drive universals and electrical shift mechanism) were prone to frequent failure. Subsequent owners addressed these issues and today, thanks in part to Imagineers like Lee Richardson, are issues of the past. 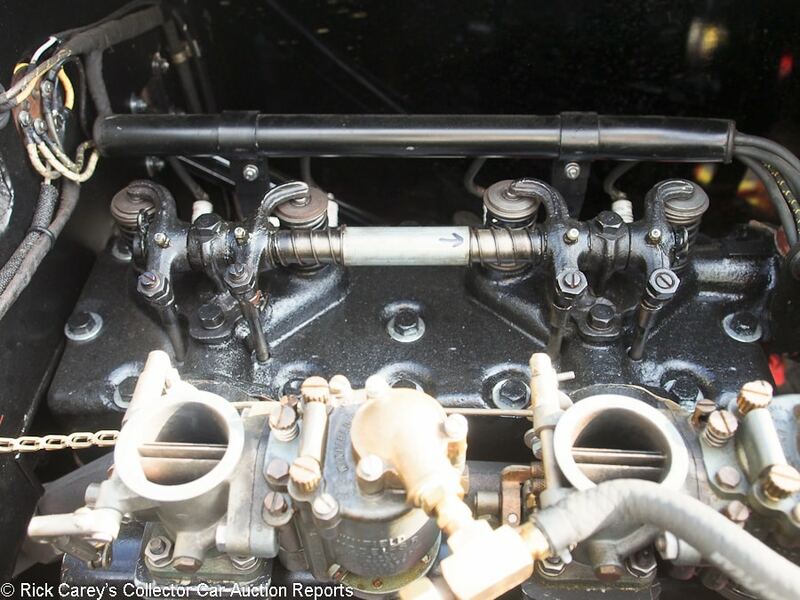 Concours cars retain the old Rzeppa joints and clunky shift linkage. Drivers who appreciate the Cord’s style and advanced design resolve them, as is evident on this rare Sportsman. The bidders at Hershey Lodge were drivers and paid well for this milestone, developed and largely perfected 812 Sportsman. The new owner (and the underbidder) had their heads on. 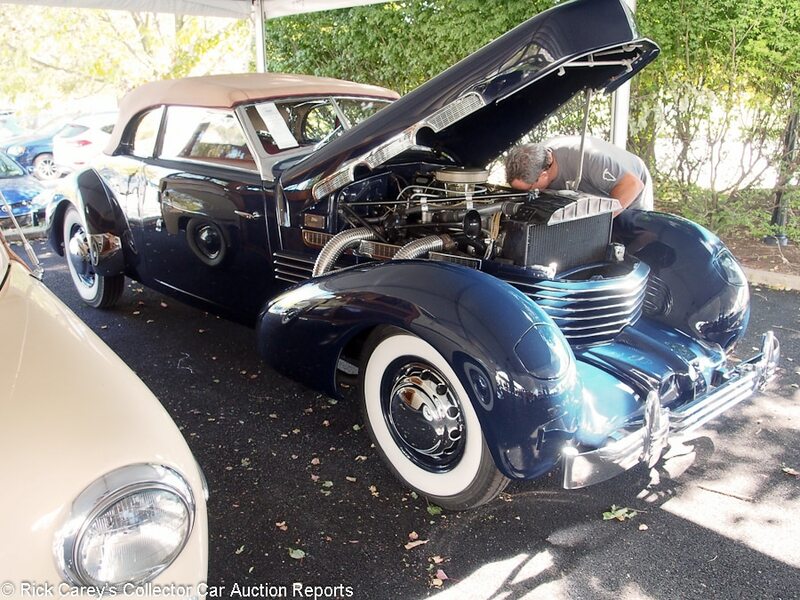 Lot # 135 1937 Cord 812 Supercharged Phaeton; S/N 81232269H; Engine # FC2984; Geneva Blue/Burgundy leather; Beige cloth top; Estimate $180,000 – $220,000; Older restoration, 2- condition; With Reserve; Hammered Sold at $192,500 plus commission of 10.00%; Final Price $211,750. – Radio, hubcaps, wide whitewalls. – Represented to have the original engine. ACD Category 1. Excellent paint, chrome, interior, dash, gauges and engine. Underbody and chassis restored to factory condition in the late 80’s and kept very well. – The quality of the restoration is apparent in its survival still in nearly showroom condition thirty years later and the bidders were encouraged to pay a healthy price for it. It was one of three Cord 812s in the auction, an embarrassment of opportunities for Cord fanciers. It was sold by RM in Monterey in 2013 for $225,500, then in Arizona in 2016 for $209,000 and has added only 67 miles to its odometer since 2013. 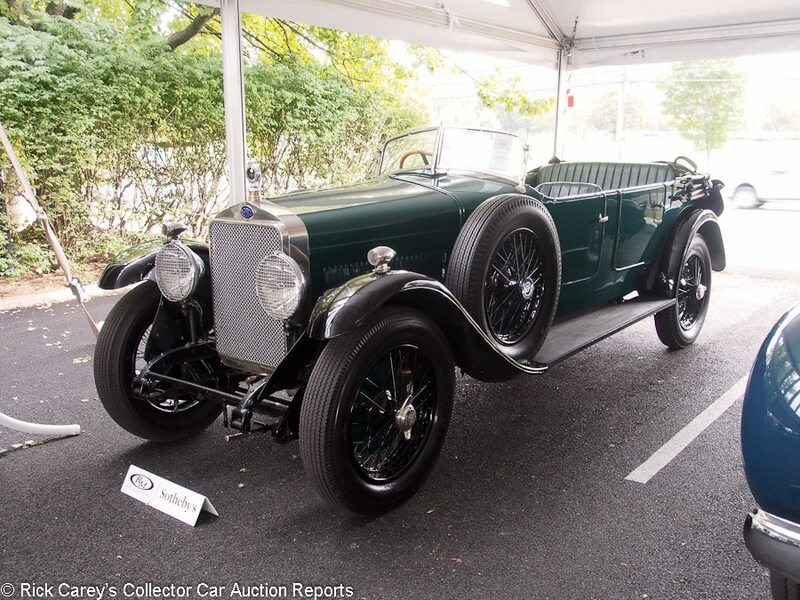 Lot # 235 1930 Delage DR 70 Tourer, Body by James Flood; S/N 29663; Green, Black fenders/Green leather; Black leatherette top; Estimate $90,000 – $110,000; Older restoration, 3 condition; With Reserve; Hammered Sold at $92,500 plus commission of 10.00%; Final Price $101,750. – 2.5 liter inline six cylinder, black painted wire wheels, blackwall tires, vee windshield, dual sidemounts, Boyce Moto Meter radiator temp gauge, headlight and radiator stone guards. – Bodied by James Flood Pty. in Australia. An older restoration, paint heavy and cracked. Some wear on interior leather. Orderly engine compartment. Peeling, discolored gauge faces. In need of a good home. – Sold at RM Amelia in 2012 for $82,500 and peddled here and there ever since, it was reported sold at Bonhams Quail Lodge in 2013 for $88,000 and at the Dragone Brothers Westport auction in 2016 for $82,500. 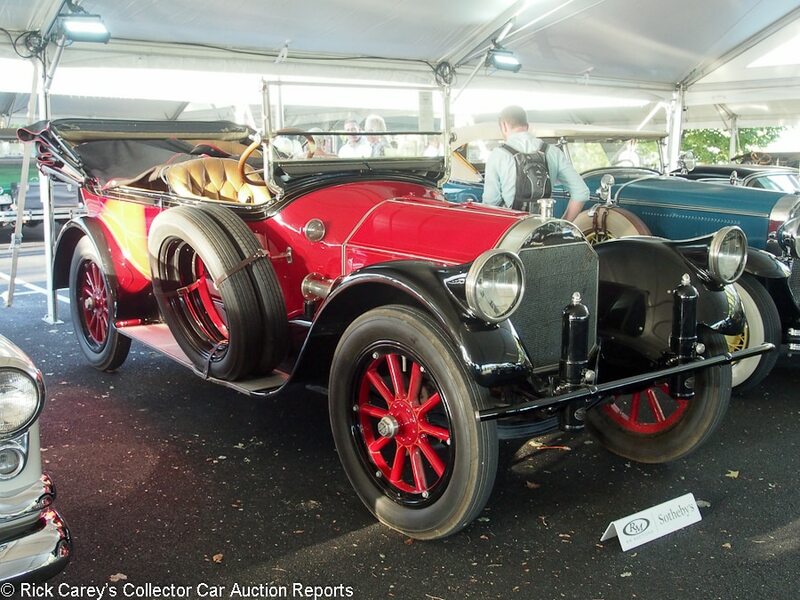 It is a classic Delage with serious potential awaiting only someone to appreciate it. At this price it was appreciated a whole lot. 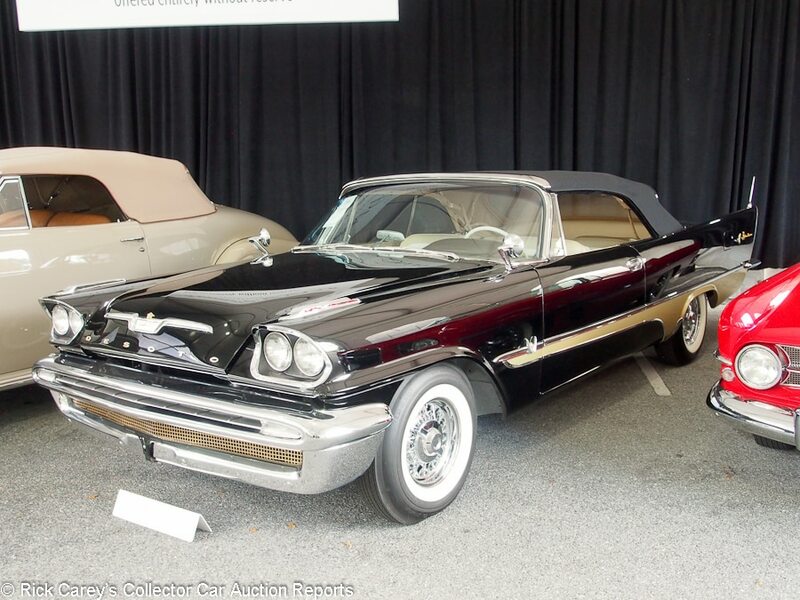 Lot # 257 1957 DeSoto Adventurer Convertible; S/N 50417133; Black, Gold accent/Beige leather, cloth; Black cloth top; Estimate $140,000 – $180,000; Older restoration, 1 condition; No Reserve; Hammered Sold at $115,000 plus commission of 10.00%; Final Price $126,500. – Chrome wire wheels, whitewall tires, pushbutton radio, dual outside mirrors, dual rear antennas, power steering, power brakes, air conditioning, steering wheel hub Benrus clock. – Excellent paint, brilliant chrome, inviting interior, tight top. Flat, flush panels, even gaps. Underbody and engine are better than new. Thomas F. Derro collection. – Sold at Barrett-Jackson Scottsdale in 1999 in essentially the same condition as it is presented here, it’s added just 269 miles to its odometer in the last 18 years and is still impeccable. Its survival is a tribute both to the quality of its restoration and its preservation in Tom Derro’s collection. The new owner could pay more, but not get much more car than this. 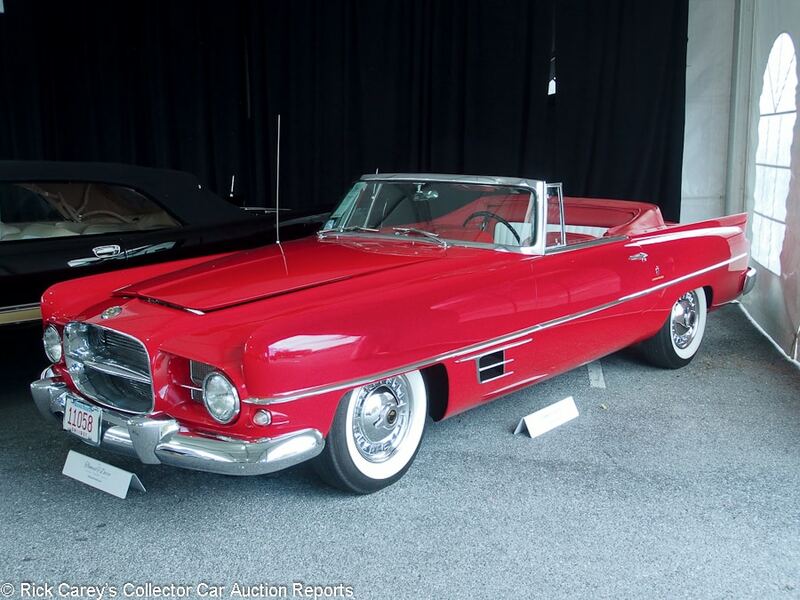 Lot # 264 1957 Dual-Ghia D/G Convertible; S/N 125; Red/Red, White leather; Black cloth top; Estimate $200,000 – $250,000; Concours restoration, 1 condition; No Reserve; Hammered Sold at $310,000 plus commission of 10.00%; Final Price $341,000. – D500 Hemi, power steering and brakes, automatic, spinner wheel covers, whitewalls, Town & Country radio. – Excellent paint, chrome and interior. Spotless engine compartment let down by a brush painted generator. Concours restored. Thomas F. Derro collection. – This is a typical Tom Derro car, beyond perfect in every respect. Dual-Ghias have brought (much) more but this one deserved the healthy price it brought. Tucked back in the preview display in Hershey this d’Ieterene Freres bodied Cab doesn’t appear to advantage. The photos at RMSothebys.com are better and I encourage further exploration to see just how good the coachwork on this car is. 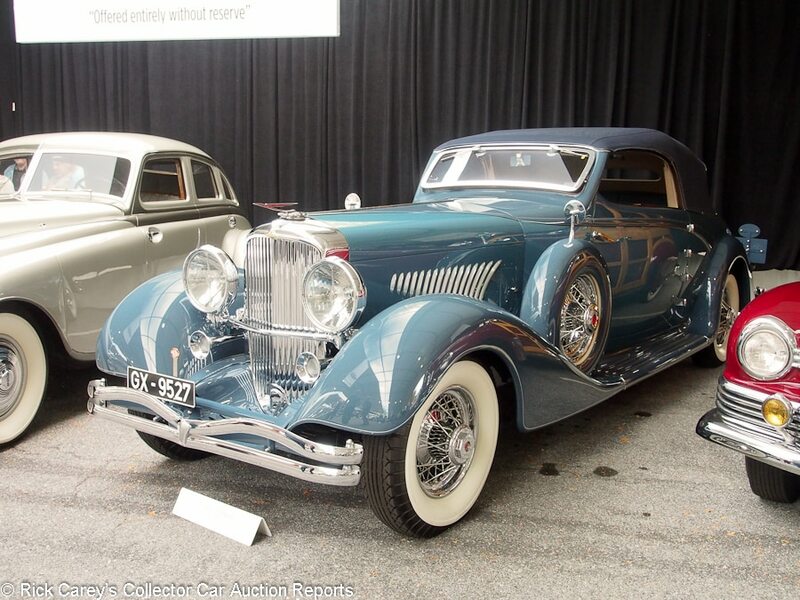 Lot # 262 1935 Duesenberg Model J Cabriolet, Body by d’Ieteren Freres; S/N 2548; Engine # J-519; Blue-Grey, Dark Blue/Dark Blue leather; Dark Blue cloth top; Estimate $1,500,000 – $2,000,000; Older restoration, 1 condition; No Reserve; Hammered Sold at $1,350,000 plus commission of 10.00%; Final Price $1,485,000. – Chrome wire wheels, wide whitewalls, dual enclosed sidemounts with mirrors, steeply raked opening windshield, Marchal headlights, dual tube bumpers. – CCCA National First Prize #69, Senior and Premier. A-C-D Category 1 original engine, frame, firewall and body. Restored in the late 90’s by Brian Joseph and still with concours cosmetics. Clean, sharp, flawless and beautiful. – This may be the prettiest Duesenberg Model J every bodied. with a sleek raked and curved windshield, sweep panel gently tapered back into the rear fender arch and an ample headroom convertible top that tapers elegantly into the rear deck. The graduated curved hood side vents are classic Duesenberg. Only the dual sidemounts interrupt the integrity of the coachwork; a pair piled on the rear deck would have completed the design and made this the Spezial Roadster of Duesenbergs. It was sold by Sotheby’s from the Rick Carroll collection in 1990 for $935,000, then by RM at Amelia Island in 2001 for $800,000 in its present condition. There are Duesenbergs, then there are Duesenbergs like this with unique, sweeping coachwork. It is a beautiful automobile with the finest underpinnings and for that this isn’t a lot of money. 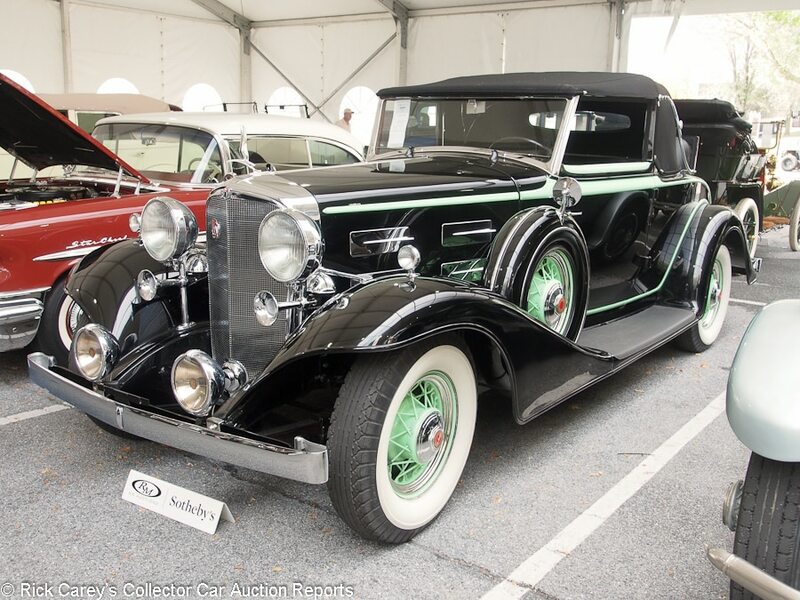 Lot # 259 1932 Duesenberg Model J Town Car, Body by Kirchhoff; S/N 2514; Engine # J-497; Light Grey, Grey accents/Grey leather, Green brocade; Estimate $750,000 – $1,000,000; Concours restoration, 1 condition; No Reserve; Hammered Sold at $540,000 plus commission of 10.00%; Final Price $594,000. – Chrome wire wheels, wide whitewalls, dual enclosed sidemount, Bosch trafficators, chrome roof rack, huge luggage trunk, gold plated rear compartment brightwork, jump seats, footrest, gorgeous figured wood interior trim. – Original chassis, engine and body. Built for the Countess Anna Ingraham, the adventurous heiress to a clock family fortune. The coachwork was Kirchhoff’s masterpiece, and he became Anna’s chauffeur on expeditions facilitated by its vast luggage capacity, and gallons of built in water tanks for her hydration. Excellent paint, chrome and interior. Spotless underbody and engine. The interior of silk brocade and grey leather has been meticulously recreated. A concours car. 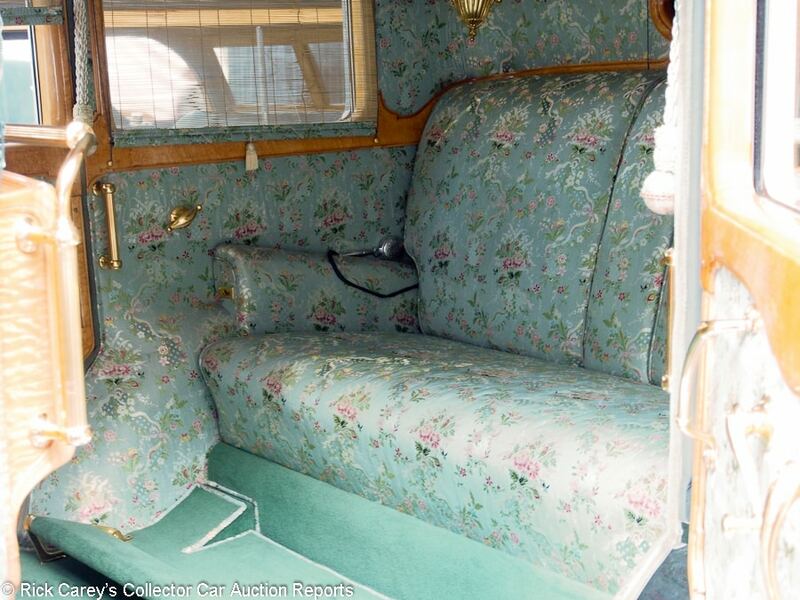 – This is nothing less than a rolling palace, fabulously appointed with silk brocade upholstery, fabulous birdseye maple moldings and gold appointments, a Versailles on wheels. It sold for $277,500 at Christie’s Lyndhurst auction in 1999 and is neither better nor worse today than it was then. A marvelous trophy automobile that is worth every dollar of the price it brought. 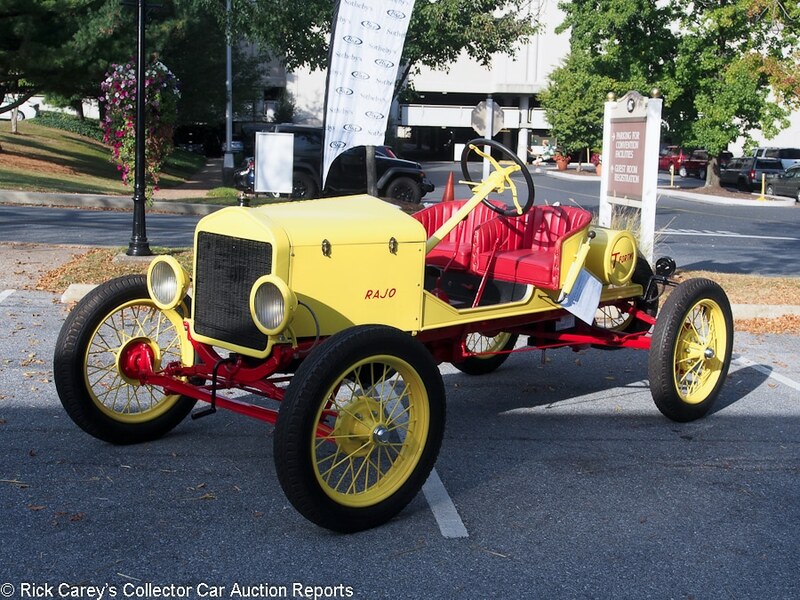 Lot # 132 1912 Flanders Model 20 Speedster; S/N 68500; Blue, Light Yellow frame and chassis/Black vinyl; No top; Estimate $25,000 – $35,000; Older restoration, 4+ condition; No Reserve; Hammered Sold at $26,000 plus commission of 10.00%; Final Price $28,600. – Oval bolster fuel tank, rear wheel brakes. – Complete but tired. – Sold by Bonhams at Greenwich last year for $30,800. This result may be less but it is still a generous price for a tired car. 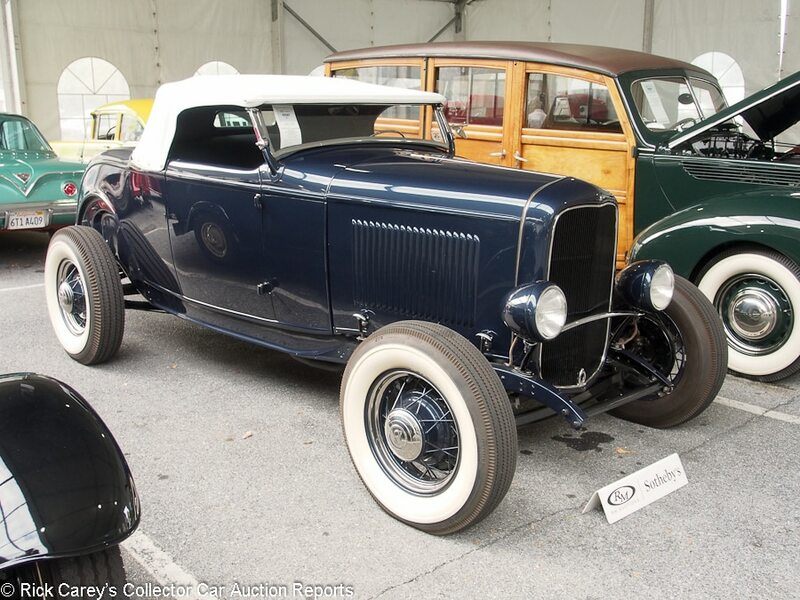 Lot # 173 1932 Ford ‘Pete Henderson’ Roadster; S/N DRF99005; Dark Blue/Blue vinyl; White vinyl top; Estimate $160,000 – $180,000; Customized restoration, 2- condition; With Reserve; Hammered Sold at $175,000 plus commission of 10.00%; Final Price $192,500. – Flathead V8, two Stromberg 97s on a high rise Weiand intake, tube headers, B-L-C headlights, no fenders, chopped top, body color wire wheels, whitewall tires, chromed banjo spoke steering wheel with the rim plastic removed. – By some accounts, the origin of the 1/4 mile drag race when Pete Henderson took on a fast quarter horse in 1944 and beat it. Kicked around many years, eventually restored by Chuck and Mike Longley in the mid-90’s, then re-restored consulting with Pete Henderson after transport damage. Good paint, chrome and interior. Easily one of the most important Ford street rods ever. Ralph Whitworth collection. – The next time the subject of a 1/4 mile acceleration E.T. comes up, think of this Deuce roadster. Its claim to fame is exactly that it may have cemented that distance in performance history. Its stature contributed to its generous price, but history is important, and so is this Deuce. Lot # 230 1951 Ford Custom Deluxe 2-Dr. Hardtop Victoria; S/N B1SP126695; Penrod Tan, Dune Beige roof/Beige vinyl, Brown cloth; Estimate $40,000 – $50,000; Older restoration, 2+ condition; No Reserve; Hammered Sold at $35,000 plus commission of 10.00%; Final Price $38,500. – 3-speed, overdrive, pushbutton radio, clock, hubcaps, wide whitewalls, bumper overriders. – Beautiful flat panels and even gaps although the hood stands a bit proud of the front fenders. Gorgeous paint, interior and chrome. Underbody is spotless. A 2008 1,000 point Dearborn Award winner and still close to that. Don Gibson collection. 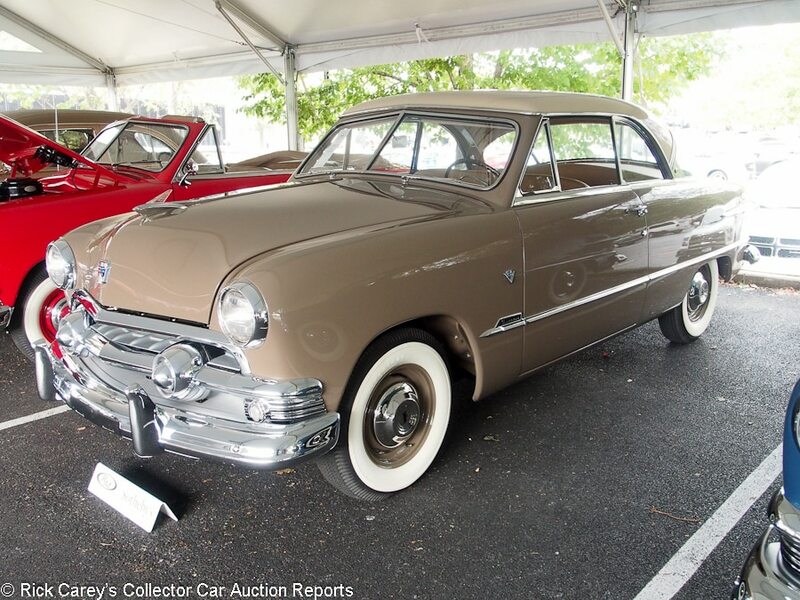 – With a plethora of ’51 Fords from the Don Gibson collection offered in succession bidder fatigue might be expected to set in, but this result has no suggestion of it, an appropriate price for a showpiece ’51 Ford. 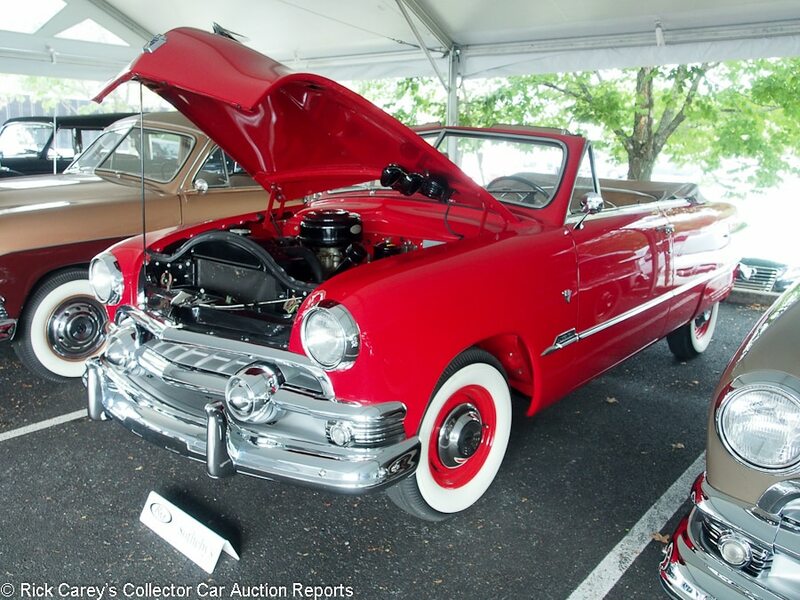 Lot # 228 1951 Ford Custom Deluxe Convertible; S/N B1LB119381; Red/Saddle vinyl; Saddle cloth top; Estimate $45,000 – $55,000; Older restoration, 2- condition; No Reserve; Hammered Sold at $26,000 plus commission of 10.00%; Final Price $28,600. – 3-speed, overdrive, pushbutton radio, heater, hubcaps, wide whitewalls, dual outside mirrors, skirts, bumper overriders, oil filter. – Excellent paint, chrome and interior. Unusual colors. Engine and underbody are like new. Body sides are friendly (they wave at you as it drives by.) 1988 Dearborn Award winner. Don Gibson collection. 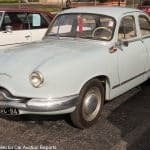 – This Don Gibson Ford isn’t up to the meticulous standards of the other Fords in his collection but is a significant example of the ground-breaking Shoebox Fords. Its price is, if anything, something of a bargain. 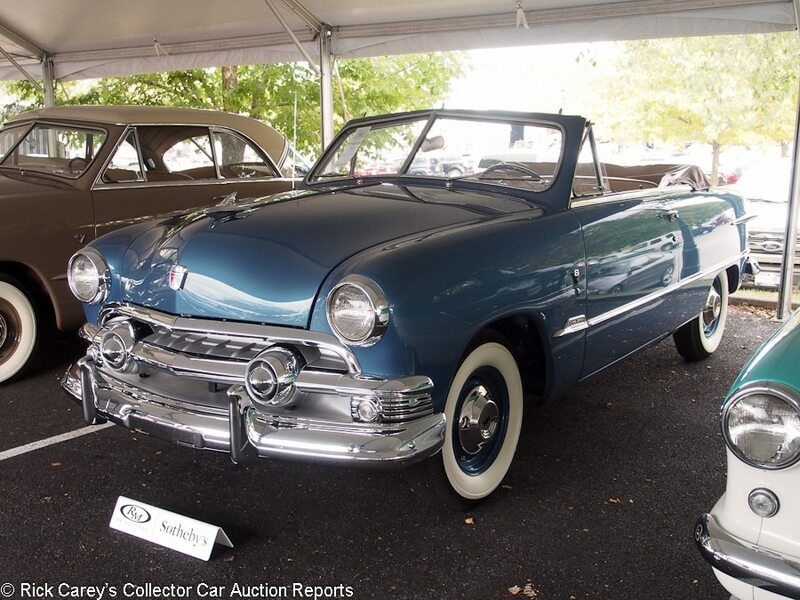 Lot # 231 1951 Ford Custom Deluxe Convertible; S/N 0476H51-29048; Culver Blue/Brown, Beige vinyl; Beige cloth top; Estimate $50,000 – $60,000; Recent restoration, 2+ condition; No Reserve; Hammered Sold at $44,000 plus commission of 10.00%; Final Price $48,400. – 3-speed, overdrive, pushbutton radio, heater, hubcaps, wide whitewalls. – Excellent paint, chrome and upholstery. Excellent panel fits except for the hood which sits about an eighth of an inch to right of center, an Angela Merkel hood. 2014 Dearborn Award winner. Don Gibson collection. 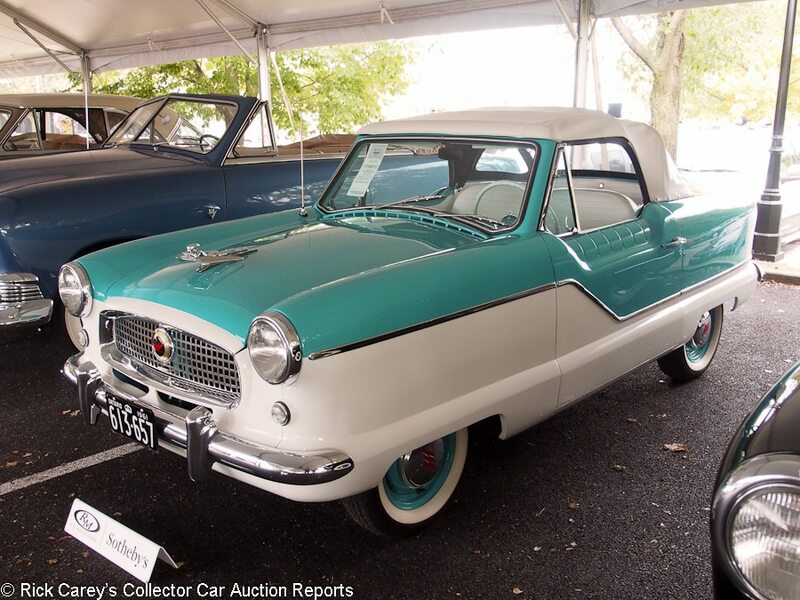 – Great colors set this Ford apart even from the other Shoebox Fords in the Don Gibson collection, and its condition and eye-appeal brought it a superior price. 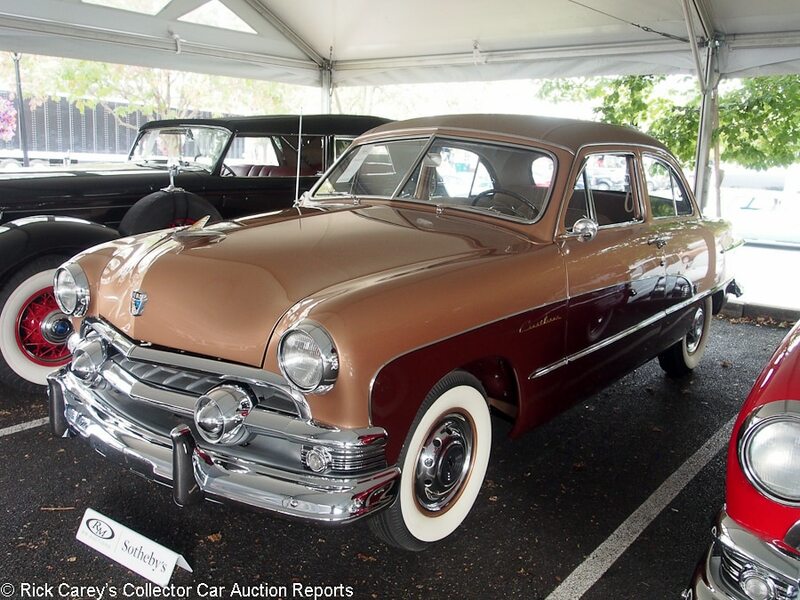 Lot # 227 1951 Ford Custom Deluxe Crestliner 2-Dr. Sedan; S/N 0470CH51-41981; Hawaiian Bronze, Brown sweep pane, Brown vinyl roof/Tan vinyl, cloth; Estimate $35,000 – $45,000; Recent restoration, 2 condition; No Reserve; Hammered Sold at $29,000 plus commission of 10.00%; Final Price $31,900. 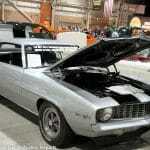 – 3-speed, overdrive, pushbutton radio, wheel covers, wide whitewalls, bumper overriders, skirts. – Flat panels, good door fits, wide hood gaps, good hood fit. Excellent paint, interior and chrome. Engine and underbody are better than new. 2003 Dearborn Award winner. Don Gibson collection. – One of a number of cars from the estate of Don Gibson, all Fords, all beautifully restored and meticulously maintained. Bidders were lined up for them and they brought serious but not unreasonable prices. RM’s Chris Summers observed that this may be the only way to acquire a Gordon Buehrig Sweep Panel design without paying six figures. Lot # 170 1938 Ford DeLuxe Station Wagon; S/N 184189475; Dark Green, Brown composite roof/Brown vinyl; Estimate $70,000 – $90,000; Older restoration, 2- condition; With Reserve; Hammered Sold at $62,500 plus commission of 10.00%; Final Price $68,750. – Fog lights, 3-row seating, hubcaps, trim rings, wide whitewalls, banjo spoke steering wheel, turn signals, hydraulic brakes. – Very good paint, chrome interior, engine and glass. The body wood is mostly original and with only a little water staining at some joints. Carburetor has a little fuel staining. Not fresh, but very good. – This restoration is over ten years old yet still shows well and wouldn’t be unreasonable to show after a comprehensive detailing. Until then it can be driven happily secure in the knowledge it was bought for a reasonable price. 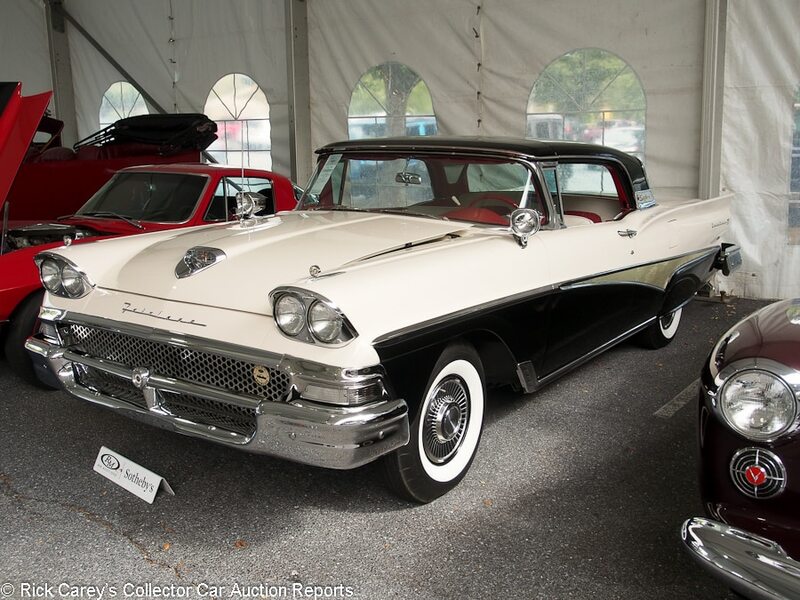 Lot # 169 1958 Ford Fairlane 500 Skyliner; S/N B8EW209851; White, Black/White vinyl, Red cloth; Estimate $50,000 – $60,000; Concours restoration, 1 condition; No Reserve; Hammered Sold at $67,000 plus commission of 10.00%; Final Price $73,700. – 332/240hp 2-barrel, power steering, power windows, automatic, skirts, continental kit, Town & Country radio, heater, wheel covers, whitewalls, dual remote spotlight/mirrors. – Restored far better than new with gorgeous paint, chrome and interior. Spotless engine compartment. Above reproach in all respects, and this on a car restored a decade and a half ago. 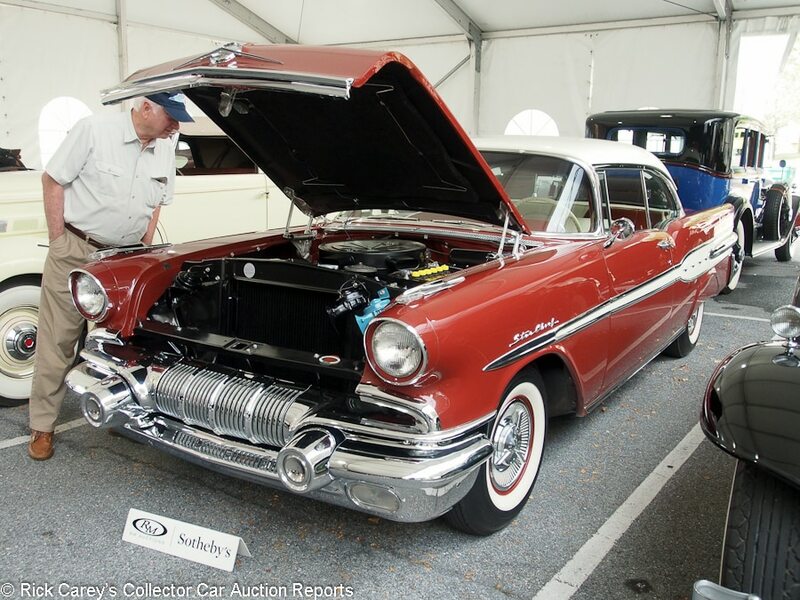 – The bidders were (appropriately) more impressed by this Skyliner than the people who set the estimate and even at almost 12% over the high pre-sale estimate it is impossible to argue with their enthusiasm. It’s that good. Lot # 175 1932 Ford Model B 3-Window Coupe Hot Rod; S/N AB5018000; Black/Black, Red vinyl; Estimate $50,000 – $65,000; Customized restoration, 3 condition; No Reserve; Hammered Sold at $82,500 plus commission of 10.00%; Final Price $90,750. – Ardun heads, S.Co.T. supercharger, dual Stromberg 97 carbs, beehive oil filter, finned aluminum sump, lowered, hubcaps, wide whitewalls, Vertex magneto, rumble seat, chopped, dropped front axle, juice brakes, 15 inch wheels. – Rough old paint artfully buffed through, oily road grimy chassis. Good replaced upholstery, no interior door panels. No passenger’s door latch. A gorgeous rat rod with an engine to die for. Ralph Whitworth collection. – No claims for the originality of the speed equipment on this Deuce Coupe were offered and it is likely that it is built with Don Orosco repro Ardun heads and sump. The S.Co.T. blower is probably original (they’re not hard to find, just expensive.) It sounds explosive and is wicked fast, attributes that make it well worth the price it brought. On the Salt during Speed Week it will not fail to attract positive attention. Lot # 176 1932 Ford Model B Roadster Pickup Hot Rod; S/N AB5242114; Blue, Black fenders/Tan vinyl; No top; Estimate $35,000 – $45,000; Customized restoration, 3 condition; No Reserve; Hammered Sold at $32,500 plus commission of 10.00%; Final Price $35,750. – Alternator, Thomas three carb intake with Stromberg 97s, Red’s headers, Ivory wire wheels, blackwall tires, wood bed floor and side boards, chrome bed strips, dropped front axle, no top or side curtains. – Intentionally dulled paint, sanded through intentionally on the hood. Chipped and rusty at the lower rear corner of the right door. Orderly and usable, if a bit strange with the overall wet sand to create fake patina. Ralph Whitworth collection. – Best suited for use in the desert, like Winnemucca, Nevada, where Ralph Whitworth intended to create his hot rod museum, or in groves where most of the roadster pickups ended up sliding under low-hanging foliage. It is thoroughly done even if the bizarre wet-sanding takes away from its appeal and brought an appropriate price. It’s under the hood that this Ford is special, with its exposed intake valve gear and the two Winfields that should double or more (?) the Model T’s original 22hp. The 3-speed gearbox adds to the driving enjoyment, coupled with the very modest price it brought, a barrel of fun for not much money. Lot # 272 1941 Ford Super DeLuxe Station Wagon; S/N 186472898; Blue, Varnish/Brown; Estimate $60,000 – $80,000; Older restoration, 2- condition; With Reserve; Hammered Sold at $52,500 plus commission of 10.00%; Final Price $57,750. – Heater, radio, 3-row seating, hubcaps, trim rings, wide whitewalls, oil filter, dual outside mirrors, dual taillights, enclosed rear spare, grille guard, bumper tips. – 1985 AACA National First Prize and Senior, Dearborn award in 1998. Very good older paint, chrome, wood, varnish and interior. Some of the wood appears to be original but much of it is newer. The engine compartment and chassis show some age and careful use after being restored like new or better. Not a show wagon any more but a wonderful driver. – Amazingly well maintained since restoration and still in essentially the same condition as it was in 2000 when Christie’s sold it for $47,000 at Tarrytown. The odometer shows 468 miles, probably all it has covered since the mid-80’s restoration, and to judge by its condition they were very carefully acquired miles. The bidders liked it for all the right reasons and it brought a price fair to both the buyer and the seller. 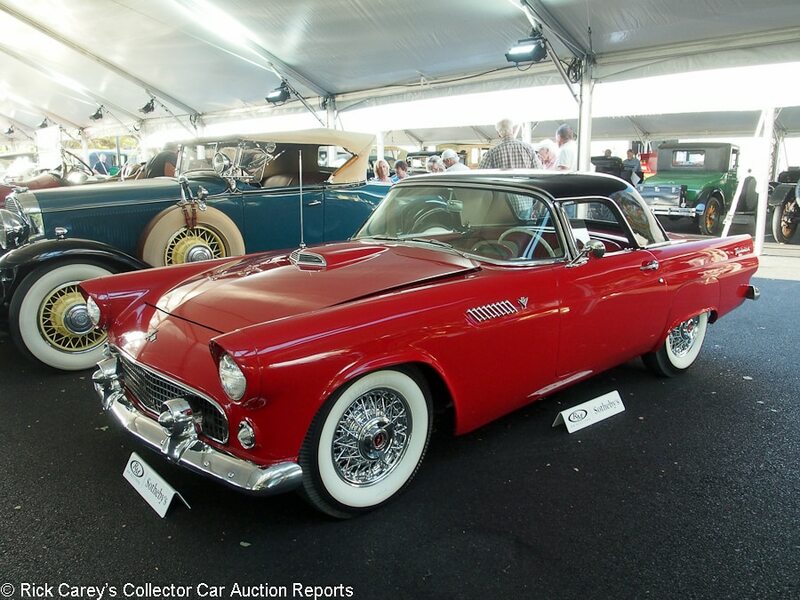 Lot # 150 1955 Ford Thunderbird Convertible; S/N P5FH148999; Torch Red, Black hardtop/Red, White vinyl; Black cloth top; Estimate $30,000 – $40,000; Visually maintained, largely original, 3- condition; No Reserve; Hammered Sold at $32,000 plus commission of 10.00%; Final Price $35,200. – 292/193hp, 3-speed, Hurst shifter, pushbutton radio, skirts, chrome wire wheels, whitewalls, Holley 4-barrel. – Hardtop is lightly scratched all over and has microblisters throughout as well as a few small dents. Dull chrome. Chip on top of the right headlight. Sap mark on the tail. Some light scratches on the front fenders. Clean underneath. Slightly dirty engine bay. Worn steering wheel. Warped dash. Metal parts of the interior are pitted. Hood and trunk fit are way off. A shabby old T-Bird. – Sold here in 2013 for $30,250 and offered at Bonhams Greenwich auction in2015 where it was reported bid to $24,000. The result here is appropriate to its condition. 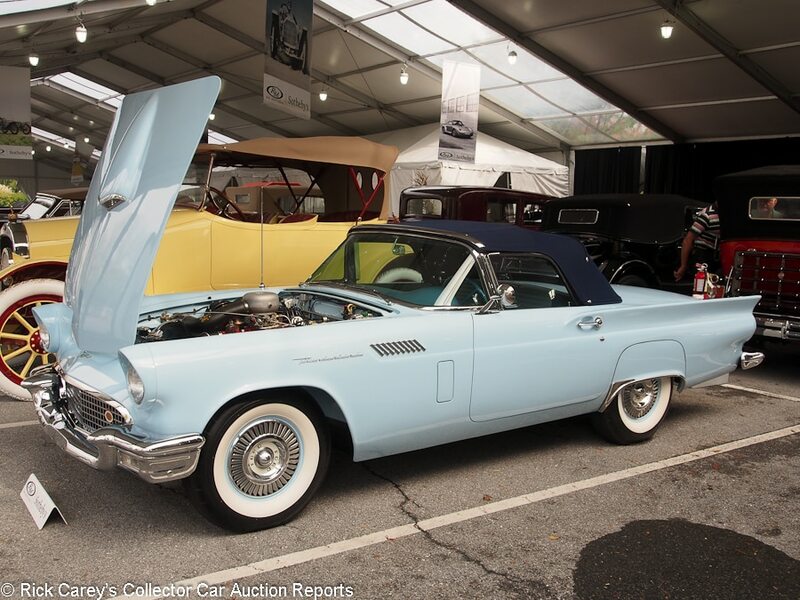 Lot # 267 1957 Ford Thunderbird Convertible; S/N F7FH347632; Starmist Blue/Two tone Blue vinyl; Dark Blue cloth top; Estimate $175,000 – $200,000; Older restoration, 1- condition; No Reserve; Hammered Sold at $135,000 plus commission of 10.00%; Final Price $148,500. – 312/300hp supercharged, 3-speed, overdrive, Town & Country radio, wheel covers, wide whitewalls, skirts, power seat, power windows, Dial-a-Matic power seat. – Excellent paint, chrome, top and interior. The engine compartment is like new except for some oil mist on the right frame and a little dust where it’s hard to reach. Restored in the 1980’s but looks like it was done last year. – Sold back in 2004 in the Kruse auction of Woodhead Fords for $165,000, then at Barrett-Jackson in 2007 for an even more impressive $220,000. It comes to market here having been maintained in superb condition since it was restored and it is cheap at this price. 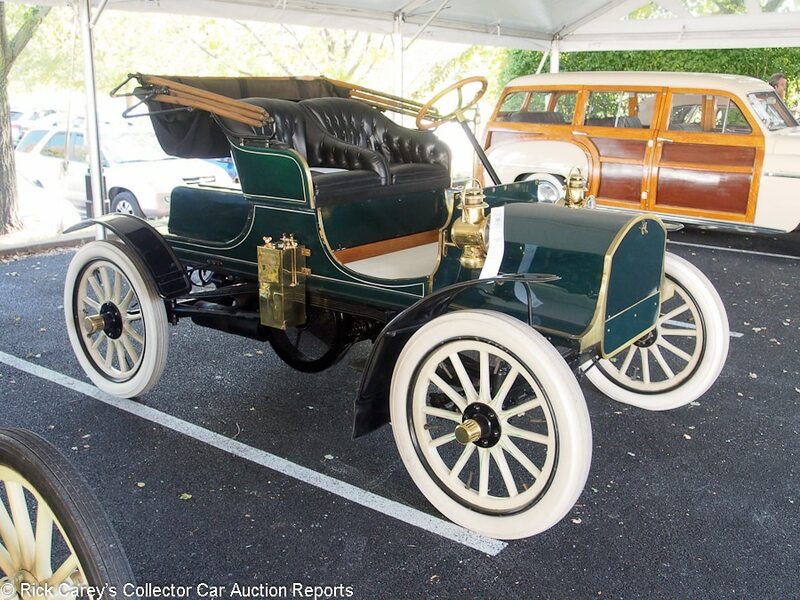 Lot # 134 1906 Knox Model F-4 Tourist; S/N 248; Dark Green, Patent leather mudguards/Black leather; Black cloth top; Estimate $30,000 – $50,000; Older restoration, 3 condition; No Reserve; Hammered Sold at $37,000 plus commission of 10.00%; Final Price $40,700. – Kerosene dashboard mounted headlights, Rushmore acetylene generator, White wood spoke wheels, white tires, wheel steering, C. T. Ham kerosene taillight, electric starter. – Good older paint with some cracks on wood panels. Good mudguards. Touched up old chassis and drivetrain. Fair brass in need of attention. A serviceable old restoration once in John Moir’s collection. – A jaunty little 2-seat runabout from the latter days of the buggy era. In sound and usable condition that needs little or nothing and yet has plenty of room for improvement. The price it brought reflects its visual appeal and sound condition. Lot # 234 1934 LaSalle Series 50 Convertible Coupe, Body by Fleetwood; S/N Engine No. 2102602; Engine # 2102602; Diana Cream/Brown leather; Tan cloth top; Estimate $140,000 – $160,000; Visually maintained, largely original, 3+ condition; With Reserve; Not sold at Hammer bid of $127,500. – Turn signals, radio, banjo spoke steering wheel, biplane bumpers, rumble seat, hubcaps, trim rings, disc wheels, wide whitewalls. – Good paint, upholstery, interior trim and chrome. Minor stress cracks; touched up edge chips on the driver’s door. The underbody shows age and use. The gauges are good but their panel would benefit from some polish. At this point it is an attractive driver that has sat a while. – Harley Earl may have made his mark with Alfred P. Sloan with the first LaSalle design but little or nothing in Earl’s subsequent years at General Motors is more succulent than this 1934 LaSalle. Its streamlined design, pontoon front fenders, biplane bumpers and five round hood side vents are delicious. This result is enough to buy several delectable Fords, but all of them together won’t be as much fun to own as this this LaSalle, a full course meal of design and performance. Lot # 273 1933 LaSalle V-8 Convertible Coupe, Body by Fisher; S/N Engine No. 2001034; Engine # 2001034; Black, Light Green accent/Black leather; Black cloth top; Estimate $100,000 – $130,000; Older restoration, 1 condition; With Reserve; Hammered Sold at $150,000 plus commission of 10.00%; Final Price $165,000. – Rumble seat, dual enclosed sidemounts with mirrors, Light Green wire wheels, wide whitewalls, Trippe lights, trunk rack chrome hood side vent doors, radio. – Excellent paint, top, interior and chrome. Underbody and chassis were restored like new and now show a little age but barely any use. It was restored as a show car, and it still is. – Sold by RM in Arizona in 2009 from Dr. Barbara Attwood’s collection for $93,500 now with newer paint, wheels and top. 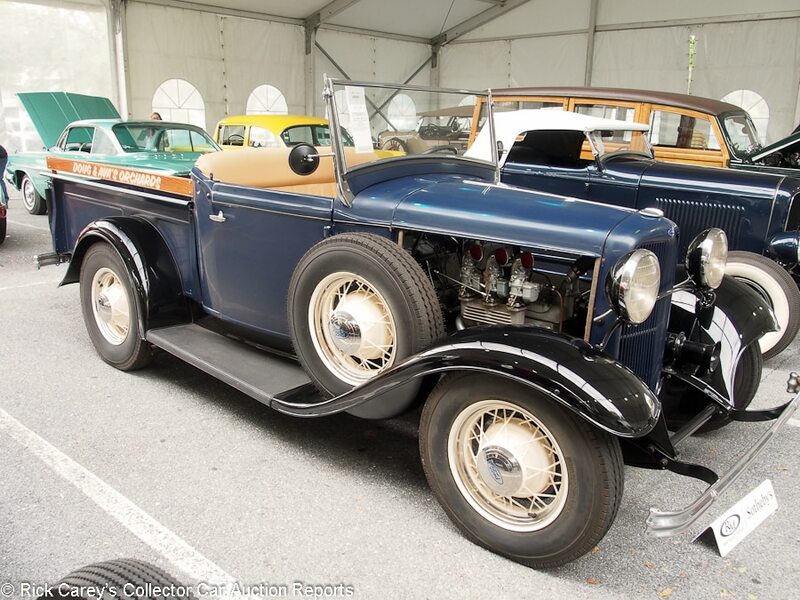 The 1934 LaSalle sold earlier today benefits from more streamlined coachwork, but this ’33 is in better condition and the bidders enthusiastically bid for it with this handsome result, a price it shouldn’t expect to bring the next time it changes hands. 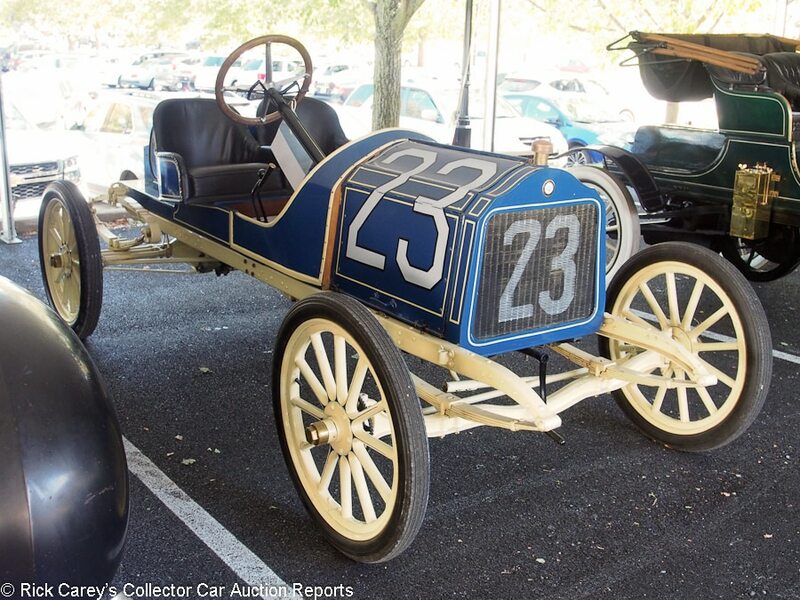 Lot # 243 1909 Locomobile Model 30-L Speedster; S/N Engine No. 2730; Engine # 2730; Black/Black leather; No top; Estimate $120,000 – $140,000; Older restoration, 3- condition; No Reserve; Hammered Sold at $88,000 plus commission of 10.00%; Final Price $96,800. – RHD. Cylinder bolster tank, dual rear spares, monocle windshield, folded trumpet bulb horn, Warner speedometer and clock, cowl mounted Rushmore acetylene spotlight, Solar kerosene sidelights, Edmunds & Jones acetylene headlights, kerosene taillight, Johnson Variable Action rear spring shackles, electric starter. – Sound old paint, worn redyed bucket seat upholstery, dull brass. Usable as is, if not particularly beautiful. Just catching up on years of neglect to the brass will take up much of the winter. – There’s no idea how it was built, but it’s been like this at least since the 1958 re-enactment of the Vanderbilt Cup road races in 1958. It’s a great, thumping old thing that will get down the road with alacrity (even if it won’t stop with the same dispatch.) It takes a hero to drive one fast, but not a hero to buy it at this reasonable price. 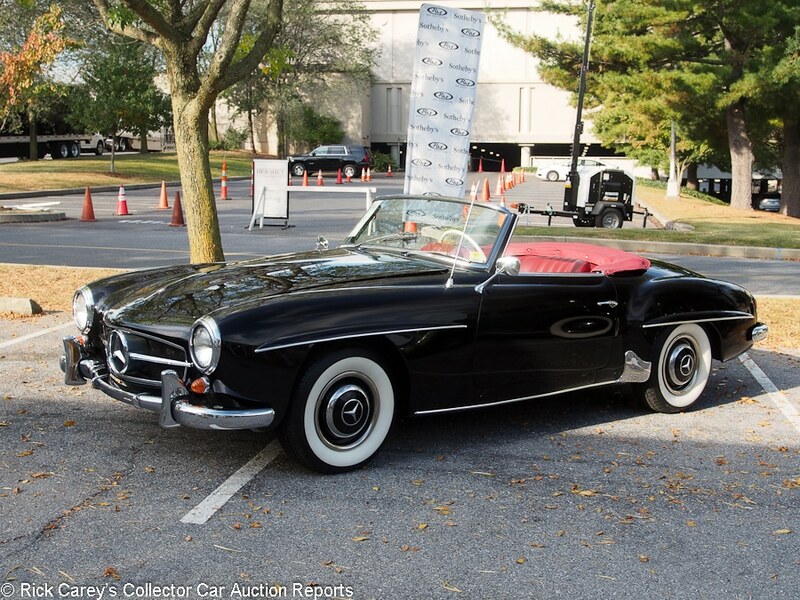 Lot # 139 1959 Mercedes-Benz 190SL Roadster; S/N 121040109501952; Black/Dark Red vinyl; Black cloth top; Estimate $125,000 – $150,000; Cosmetic restoration, 3+ condition; With Reserve; Hammered Sold at $110,000 plus commission of 10.00%; Final Price $121,000. – Blaupunkt pushbutton radio, hubcaps, trim rings, wide whitewall radial tires. – Good paint, chrome and interior, new top. Flat panels and even gaps, Good dash and gauges. The engine has been out, redone with Weber carbs and put back into a superficially prepared engine compartment. The underbody and chassis have been squirted with some chassis black. 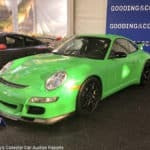 It is an auction car that makes a good first impression. – First impressions count, but don’t last long and this 190SL is generously priced for its superficial presentation. 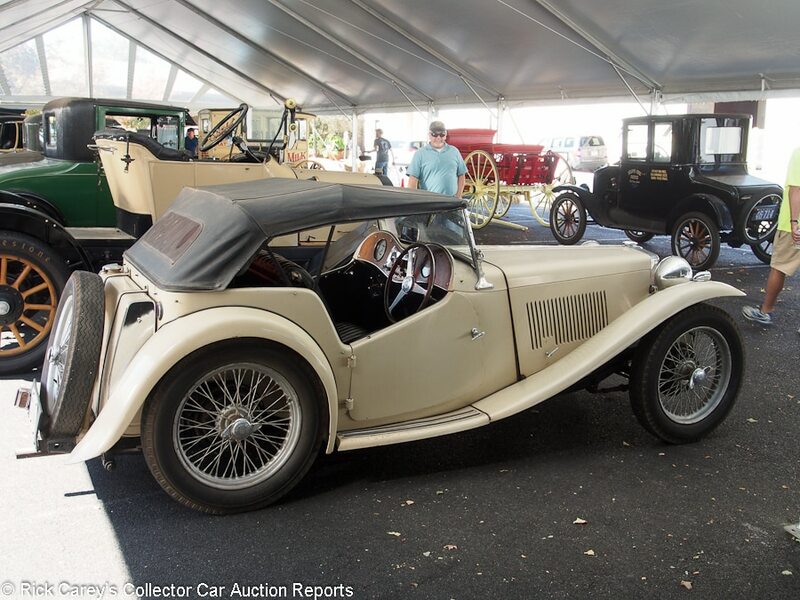 Lot # 128 1949 MG TC Roadster; S/N TC6766; Engine # XPAG7449; OE White/Black vinyl; Black vinyl top; Estimate $25,000 – $30,000; Visually maintained, largely original, 4+ condition; No Reserve; Hammered Sold at $19,500 plus commission of 10.00%; Final Price $21,450. – RHD. Silver painted wire wheels, woodrim steering wheel. – Sound old paint, old upholstery and real old top. Dirty engine and chassis. Once owned by Jim Hall but not used in a long time. – The Jim Hall history seems to have brought a few extra dollars for this bedraggled TC. 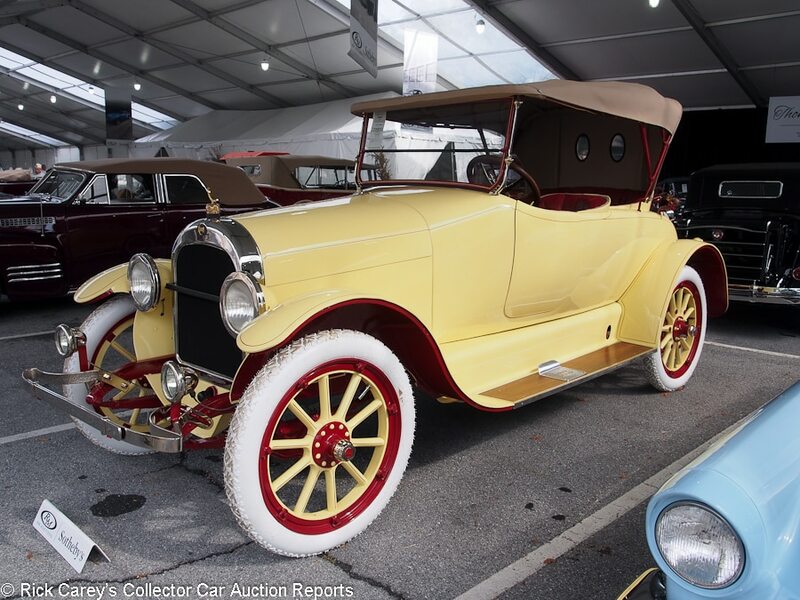 Lot # 244 1918 Moon 6-45 Cloverleaf Roadster; S/N 71700; Yellow/Red leather; Beige cloth top; Estimate $70,000 – $90,000; Concours restoration, 1 condition; With Reserve; Hammered Sold at $60,000 plus commission of 10.00%; Final Price $66,000. – Body color wood spoke wheels, Dark Red rims, hubs and chassis, White Non Skid tires, Tilt-Ray headlights, S&S electric driving lights, Van Sicklen speedometer. – Excellent paint, bright nickel, excellent interior and top. The engine and chassis are essentially like new. Shown at Pebble Beach. A beautiful example of a rare car. – It’s called a ‘cloverleaf’ because it has a single rear seat, resembling a clover leaf when viewed from the top. Comparables for Moons are few and far between but this seems like a realistic result even at a record auction price for a Moon. Lot # 256 1948 Nash Ambassador Super Suburban; S/N Engine No. RE45244; Engine # RE45244; Sunset Maroon, Varnish/Red leather, Tartan cloth; Estimate $80,000 – $120,000; Concours restoration, 1- condition; No Reserve; Hammered Sold at $115,000 plus commission of 10.00%; Final Price $126,500. – 3-speed, overdrive, hubcaps, trim rings, wide whitewalls, windshield visor, roof rack, skirts, dual remote spotlights, fog lights. 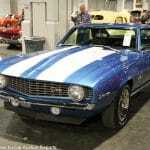 – Restored by Lloyd Mayes better than new with great paint, interior and most chrome except the hood side moldings. Plastic Wood filled joints at the right rear of the body and on the left rear door. Thomas S. Derro Collection. 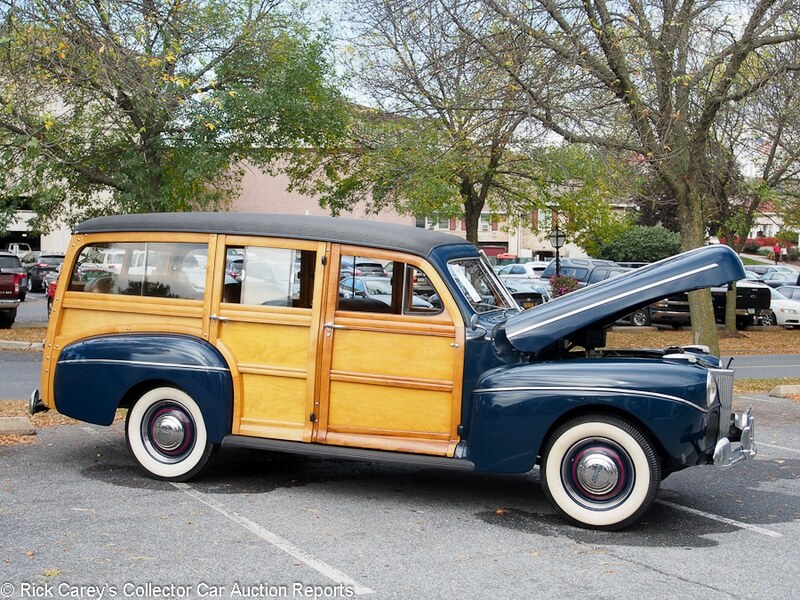 – The Plastic Wood is disappointing in a Lloyd Mayes restoration, a factor in the moderate price this Nash Suburban brought. With 130 built in 1948 it is unlikely find a counterpart anywhere and is a showpiece at a moderate price. 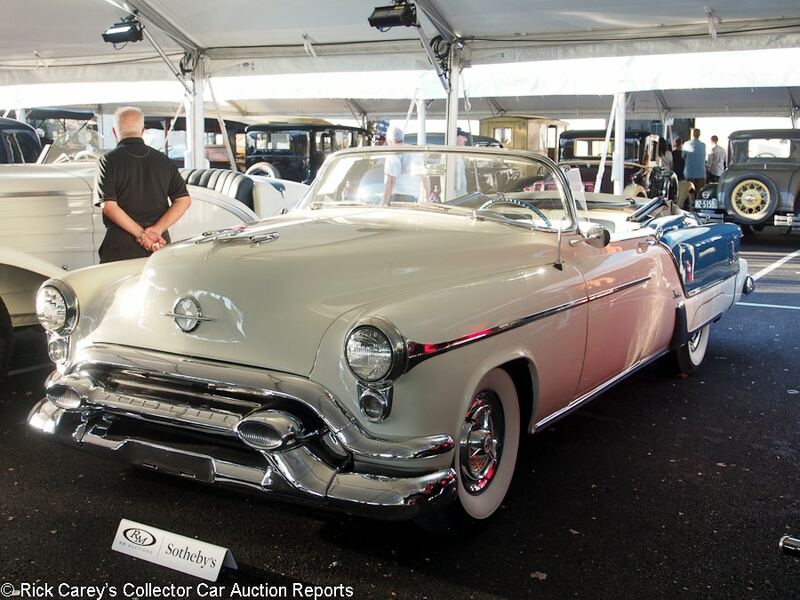 Lot # 153 1953 Oldsmobile Ninety-Eight Fiesta Convertible; S/N 539M37898; White, Metallic Blue/White, Blue; White vinyl top; Estimate $150,000 – $175,000; Cosmetic restoration, 3 condition; With Reserve; Hammered Sold at $120,000 plus commission of 10.00%; Final Price $132,000. – Automatic, power steering and brakes, pushbutton radio, power antenna, power windows, skirts, continental kit. – Good paint, chrome and interior. Uneven door fits and a big touched up scrape on the back edge of the passenger’s door. The underbody is still in ancient undercoat and has not been restored. Paint chips at the front right hood corner. What can be seen under the hood is fresh and clean, what can’t be seen is old. An auction car. – This was a largely original, solid car when offered at Auburn Fall in 2002 with a reported high bid of $73,000. It’s had a repaint and new interior since then, some freshening up under the hood and added 469 miles to the odometer (which was stated as original miles in ’02) bringing the total to 72,170 but it is far from the ‘immaculately restored’ car described in the catalog. The continental kit is truly ugly and all that road-hugging weight hanging off the rear must make it handle like an overweight oil tanker. The result here is truly generous for a superficially redone Fiesta. 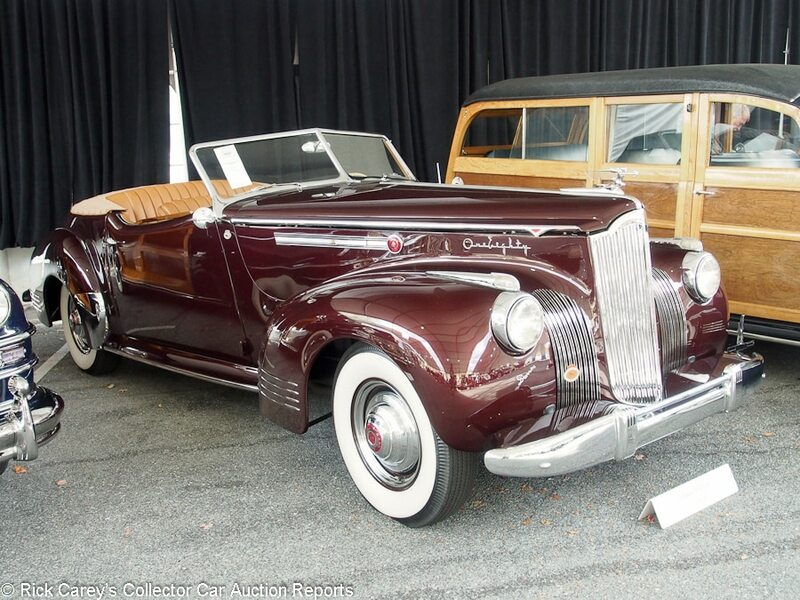 Lot # 254 1941 Packard Custom Super Eight One Eighty Convertible Victoria, Body by Darrin; S/N 14292014; Metallic Burgundy/Tan leather; Beige cloth top; Estimate $350,000 – $425,000; Older restoration, 2+ condition; No Reserve; Hammered Sold at $370,000 plus commission of 10.00%; Final Price $407,000. – Hubcaps, trim rings, wide whitewalls, radio, skirts. – CCCA National First Prize #1679, Senior and Premier. The TV show ‘Banacek’ Darrin. Restored like new with excellent paint, chrome and interior by Don Sears. Underbody is done to factory standards. Interior is lightly stretched. Crisp dash and gauges. Flat panels and flush fits. Thomas S. Derro Collection. – This is the first of the eleven Tom Derro Collection cars and it sets the tone for all of them: beyond perfect and meticulously maintained. It is benchmark for Darrin Convertible Victoria values and it deserves to be. Lot # 274 1936 Packard One Twenty Convertible Sedan; S/N 9971378; Cream/Tan leather; Beige cloth top; Estimate $70,000 – $85,000; Older restoration, 2- condition; With Reserve; Hammered Sold at $67,000 plus commission of 10.00%; Final Price $73,700. – Hubcaps, trim rings, wide whitewalls, dual enclosed sidemounts, remote spotlight, Guide fog lights, trunk rack, radio, heater, turn signals, banjo spoke steering wheel. – Driver’s side middle door gap is noticeably wider than the passenger’s side. Other than that quibble the body panels and fits are very good. Paint, chrome, interior and top are uniformly very good. The underbody was restored like new and now is aged and a little dusty but still very good. – A fine automobile with a quality restoration and a reasonable price. The fully enclosed convertible sedan coachwork is attractive and practical on tours and events. 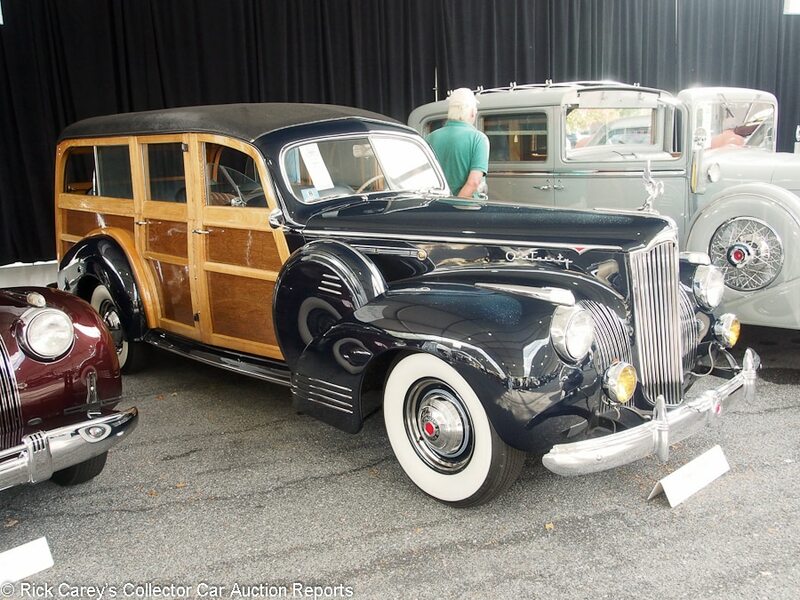 Lot # 261 1941 Packard One Twenty Station Sedan, Body by Hercules; S/N 14932048; Black/Blue leather; Estimate $80,000 – $100,000; Older restoration, 2- condition; No Reserve; Hammered Sold at $87,500 plus commission of 10.00%; Final Price $96,250. – Fog lights, dual enclosed sidemounts, hubcaps, trim rings, wide whitewalls, dual outside mirrors, 3-row seating, pushbutton radio, heater, turn signals. – 1991 AACA National First Prize and Senior. Very good paint, chrome and interior. Underbody is restored to factory standards. Thomas F. Derro collection. – If you’re Packard making a ‘station wagon’ is somehow déclassé. You call it a ‘station sedan’, a wagon by another name. By whatever name it’s still classy, as the bidders concluded here. 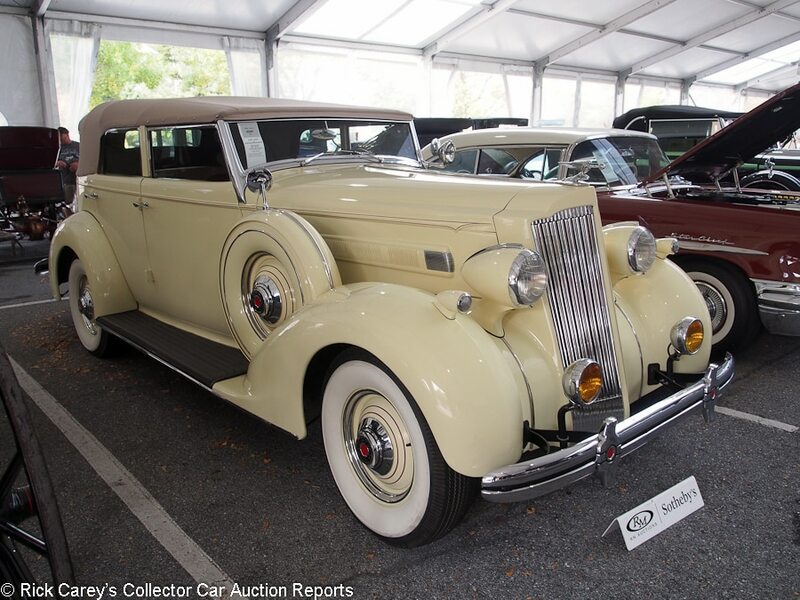 Lot # 242 1935 Packard Twelve Dual Cowl Sport Phaeton, Body by Dietrich; S/N 821202; Burgundy/Beige leather; Black cloth top; Estimate $475,000 – $575,000; Older restoration, 3+ condition; With Reserve; Hammered Sold at $450,000 plus commission of 10.00%; Final Price $495,000. – Chrome wire wheels, blackwall tires, dual enclosed sidemounts with mirrors, spotlight, dual windshields with windwings, Ride Control. – Very good older upholstery and chrome. Paint has some small stress cracks and is shrinking badly on both cowls and the left hood top. CCCA National First Prize #0899 and Senior. Thin hood side vent chrome. Clean and orderly engine showing age. Chassis and underbody were concours restored but now are aged, dusty and show some miles. Cleaned up for the auction but not thoroughly. – This is a gorgeous, impressive automobile of the highest quality. And it brought a price worthy of its quality and its condition. It has a marvelous look to it that brings to mind FDR sitting in the back seat. Lot # 152 1916 Pierce-Arrow Model 38-C-4 5-Passenger Touring; S/N 36793; Red, Black fenders and accent/Beige leather; Black cloth top; Estimate $125,000 – $175,000; Older restoration, 2- condition; With Reserve; Hammered Sold at $140,000 plus commission of 10.00%; Final Price $154,000. – RHD. Red wheels with blackwall tires and dual driver’s side-mounted spares. Westinghouse air spring shackles, 8-day clock, Klaxon electric horn, Dawley headlights. – Straight body work with excellent paint. Some chips in the wheels and wear around door and bonnet edges. Upholstery has a nice patina. Nickel plating has plenty of polish marks. Restored in the mid to late 80’s to show standards but not today’s Pebble Beach standards, but a terrific tour car. – Sold by Gooding & Company at Amelia Island in 2011 for $181,500, the passing years have left their mark on the car even though its odometer has added only 195 miles. A great tour car, it brought a price here that is fair to both the buyer and the seller. 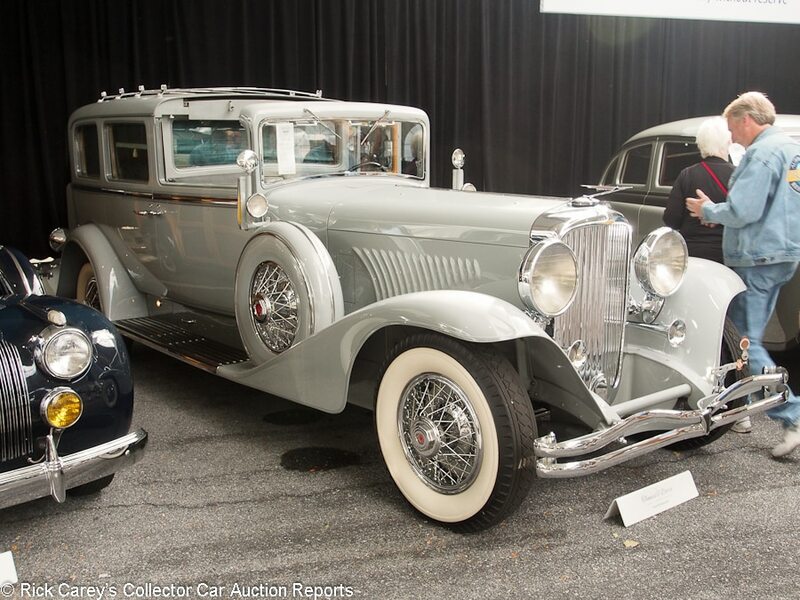 Lot # 265 1933 Pierce-Arrow Silver Arrow 4-Dr. Fastback Sedan; S/N 2575015; Silver, Pewter Grey/Grey cloth; Estimate $2,000,000 – $3,000,000; Concours restoration, 1- condition; No Reserve; Hammered Sold at $2,100,000 plus commission of 10.00%; Final Price $2,310,000. – Wheel covers, wide whitewall, skirts. – AACA National First Prize 1998, CCCA National First Prize #2086, Senior and Premier. A concours car. The New York and Boston show car, first sold to M.C. Hudson, promoter of ‘Crazy Water’. Later owned by Movie World’s Jim Brucker. Restored by Mike Fennel for Blackhawk. Lovely interior wood. Undercoated wheel wells. The intricate body fits perfectly. Finish is gorgeous except for two small cracks on the right hood. The engine is meticulously finished and immaculately detailed. It’s possible to fault, but not in any way that’s significant to it design or history. – There are three surviving Silver Arrows. This is the best and most pure of them although RM got $3,740,000 for the Chicago show car in New York in 2015. Reset expectations are evident here, but only a few cars in the world challenge this Silver Arrow’s presence. Bought right. 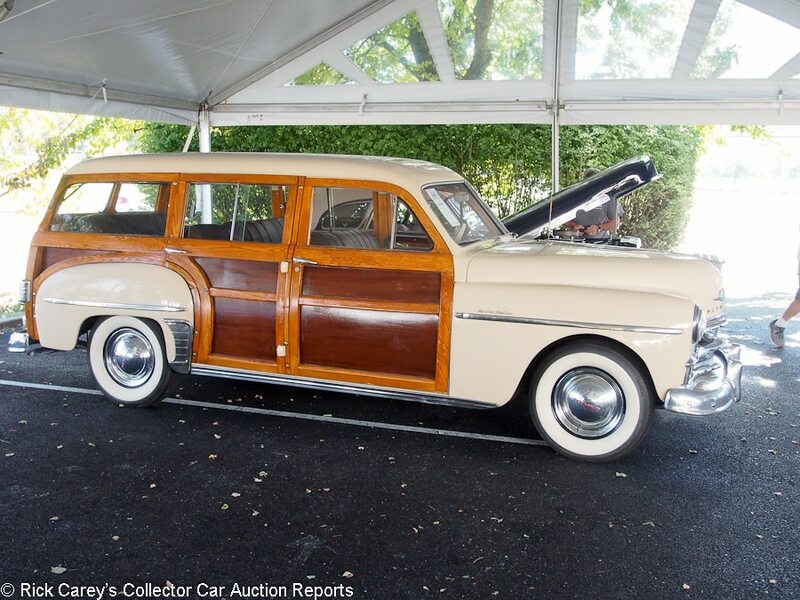 Lot # 136 1950 Plymouth Special Deluxe Station Wagon; S/N 12387404; Cream/Red leather; Beige cloth top; Estimate $35,000 – $45,000; Visually maintained, largely original, 3 condition; No Reserve; Hammered Sold at $21,000 plus commission of 10.00%; Final Price $23,100. – 3-speed, heater, pushbutton radio, hubcaps, wide trim rings, wide whitewalls, 2-row seating, enclosed rear spare built into the tailgate. – Rough original wood with thick varnish. Uneven door gaps. Old chrome. Sound repaint and interior. Aged dash, steering wheel and gauges. Old body seals. Underbody is original. A usable car, and probably too good to restore. – Not often seen but even with a whopping 97 hp from the flathead six it lacks the appeal of its V8 counterparts from Ford. This price accurately reflects its value and it would be financially pointless to do more than sand the wood and revarnish it. Lot # 279 1957 Pontiac Star Chief Custom 2-Dr. Hardtop Catalina; S/N P857H39166; Cordova Red, Kenya Ivory roof and accent/Dark Red, Cream leather; Estimate $40,000 – $50,000; Older restoration, 2- condition; No Reserve; Hammered Sold at $66,000 plus commission of 10.00%; Final Price $72,600. – 347/290hp, Tri-Power, automatic, power steering, power brakes, WonderBar radio, heater, spinner wheel covers, whitewall bias ply tires. – 1996 AACA National First Prize and Senior. Excellent paint and chrome. Very good claimed original upholstery with some stretching and surface creases. The engine compartment, chassis and underbody were restored like new and are still darned near in showroom condition. – Sold at Barrett-Jackson Scottsdale in 2011 for $110,000 then reported sold by RM in Arizona earlier this year for an inexplicably low $35,200. The restoration may be old but it has been maintained in superb condition. It is much, much more rare than a comparable Bel Air, has gobs of power and brought a deserved superior price. Its result in Arizona is an aberration that the seller took advantage of but even paying double here isn’t unreasonable. 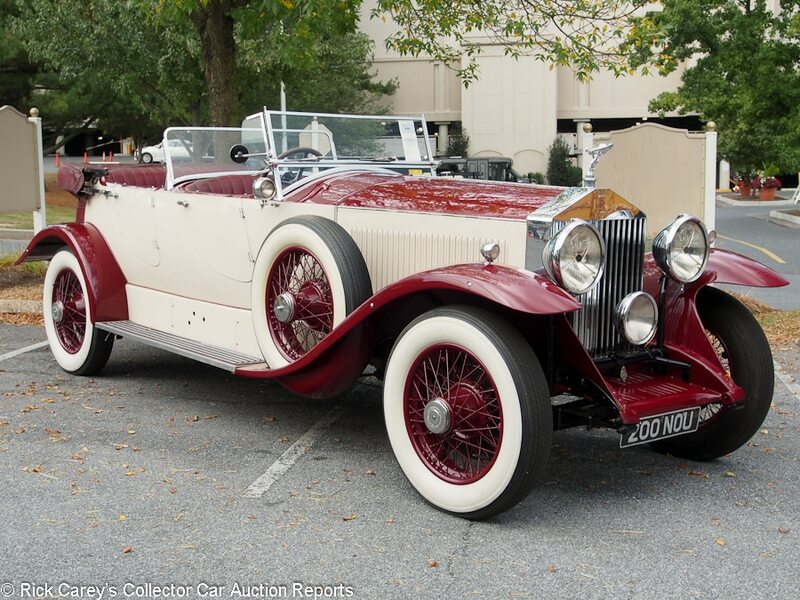 Lot # 142 1928 Rolls-Royce Phantom I Tourer; S/N 70KR; Burgundy, White sides/Burgundy leather; Beige cloth top; Estimate $90,000 – $110,000; Rebodied or re-created, 3- condition; No Reserve; Hammered Sold at $74,000 plus commission of 10.00%; Final Price $81,400. – RHD. Body color wire wheels, wide whitewalls, dual sidemounts, dual windshields, burgundy leather covered trunk, Lucas driving light. – Originally a Thrupp & Maberly landaulette, rebodied in the U.K in the 1960’s. Partially repainted with poor masking and some overspray. Sound old upholstery but for a worn out, torn corner due to entry/exit wear. Cracked left rear door. Engine, chassis and underbody were done a long time ago and have been well preserved. Pitted, rusty trim chrome, good radiator and headlight shells. 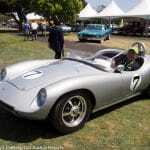 – Offered by Bonhams at the Simeone Museum three years ago where it was reported bid to $75,000. It is an undistinguished but reasonably practical Phantom with a deteriorated old restoration that brought a surprisingly generous price. 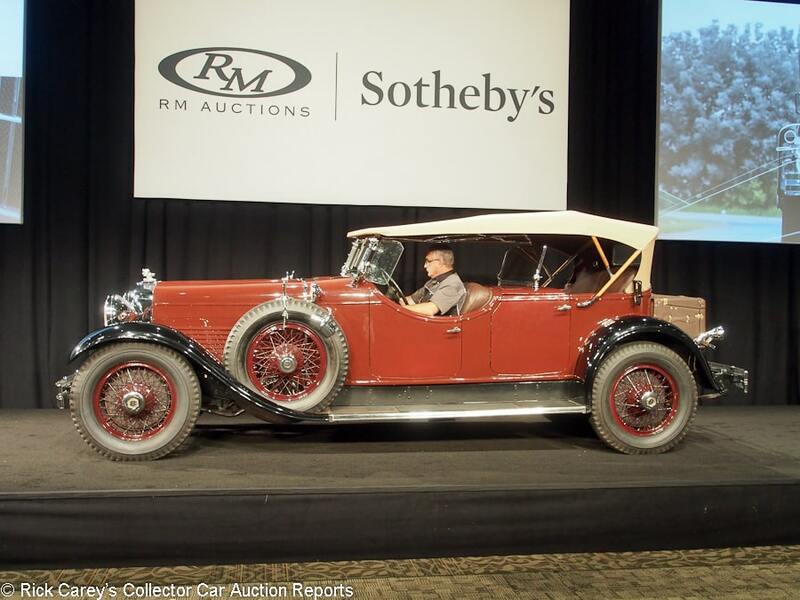 Lot # 130 1929 Stutz Model M 4-Passenger Tonneau Cowl Speedster, Body by LeBaron; S/N M844CY25D; Engine # 30514; Burgundy, Black fenders/Burgundy leather; Beige cloth top; Estimate $240,000 – $280,000; Older restoration, 3+ condition; With Reserve; Hammered Sold at $175,000 plus commission of 10.00%; Final Price $192,500. – Body color wire wheels, blackwall tires, dual sidemounts with mirrors, dual windshield, Burgundy leather covered trunk, Ryan Lite headlights, turn signals. – Ex-A.K. Miller (aka Nutzy Stutzy.) Serviceable paint, good upholstery, top and glass. Dirty instrument glass, dull dashboard brightwork and curdled dashboard varnish. Chassis and engine were done to good touring standards. A good tour car with lovely, sporting coachwork with cutdown doors. – The high point of the 1996 Christie’s auction of A.K. Miller’s Stutz stash in East Orange, Vermont when it sold for $77,300 in the usual Miller condition: rundown and dilapidated. It’s now much better (it wouldn’t be possible to be much worse) but still only in touring condition, something for which it should be a real joy. The owners have gotten good value from it, and the new owner likewise will get more good value from it at this realistic price. 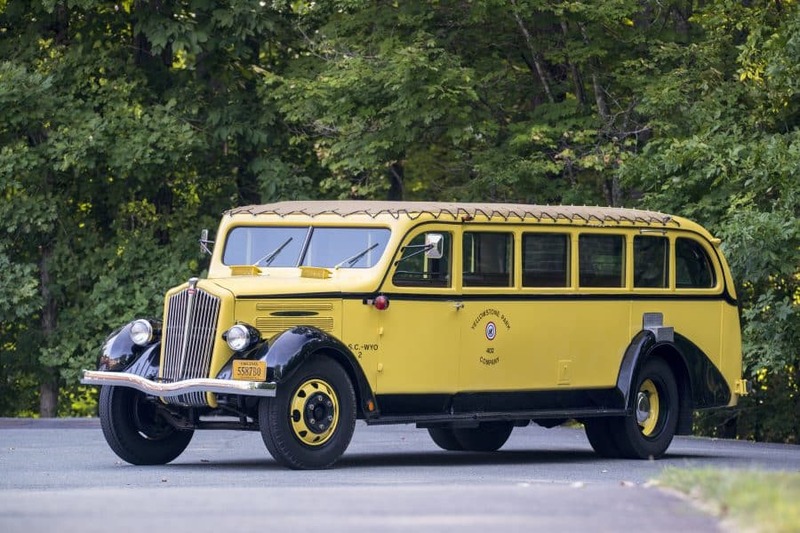 Lot # 123 1937 White Model 706 Yellowstone Park Tour Bus, Body by Bender; S/N 202761; Yellow, Black fenders and accent/Brown leatherette; Tan cloth top; Estimate $30,000 – $40,000; Not viewed, notes from the catalog; No Reserve; Hammered Sold at $150,000 plus commission of 10.00%; Final Price $165,000. – 300cid Ford six, automatic, power steering, power brakes, 12 volt electrics, Autometer gauges. – One of the sensations of the sale, when it came onto the block the entire phone bidders’ section jumped to their feet and began actively taking calls. During the preview one onlooker was overheard asserting, ‘I’m going to own it,’ and it was that kind of fevered bidding. Quick, find another one and fix it up before the fever subsides, there is a $145,000 underbidder out there somewhere.